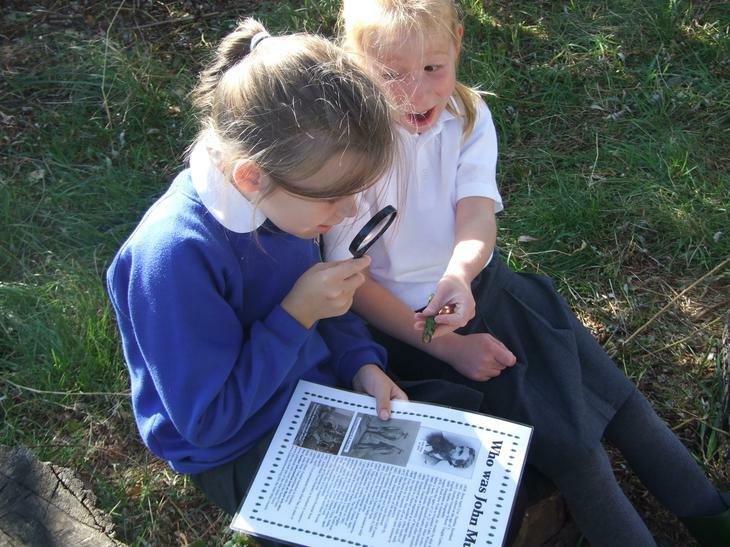 The John Muir Award was created in 1997 by The John Muir Trust to encourage children and adults protect and enhance wild places in the UK. 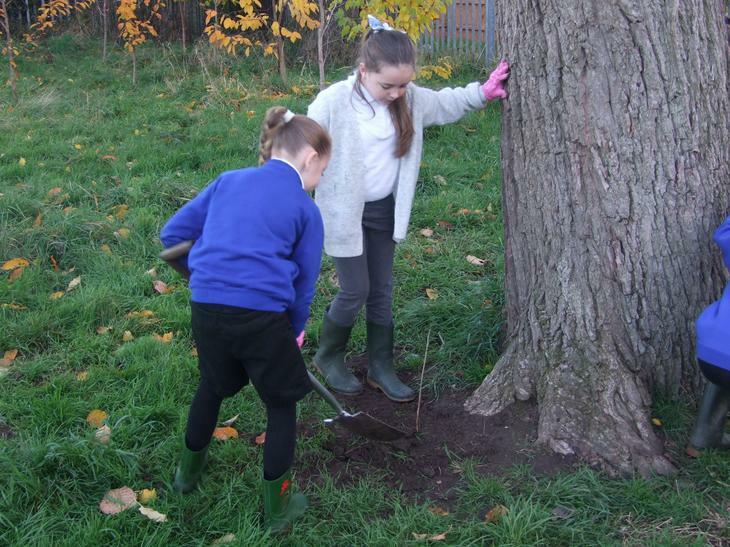 The John Muir Trust is a conservation charity that owns and manages some of the finest wild places in Britain including our highest mountain - Ben Nevis in Scotland and Helvellyn the third highest mountain in England which is in The Lake District National Park. 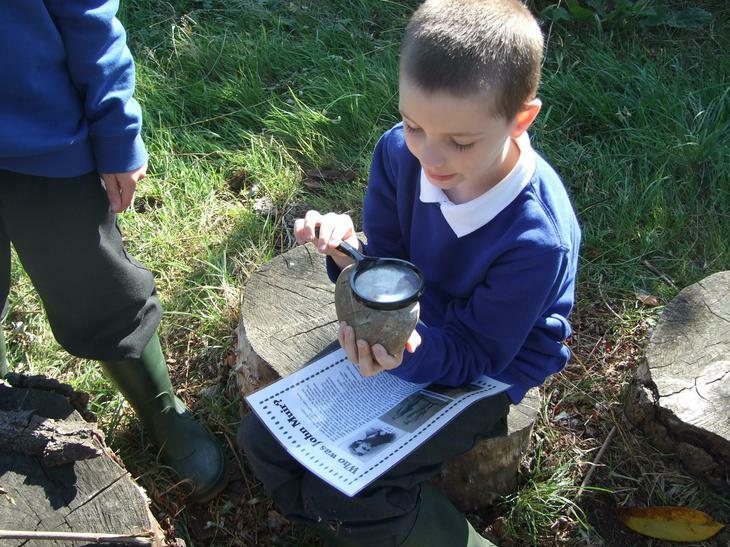 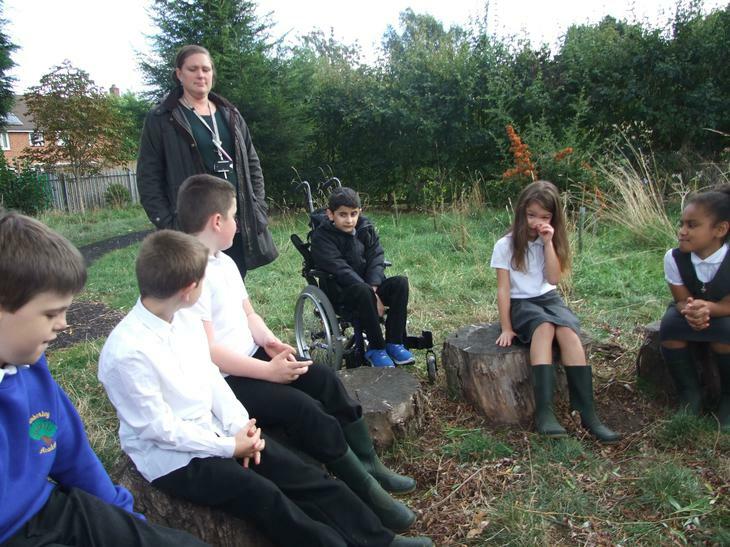 The children at Timberley Academy have been taking part in The John Muir Award every year since 2005. 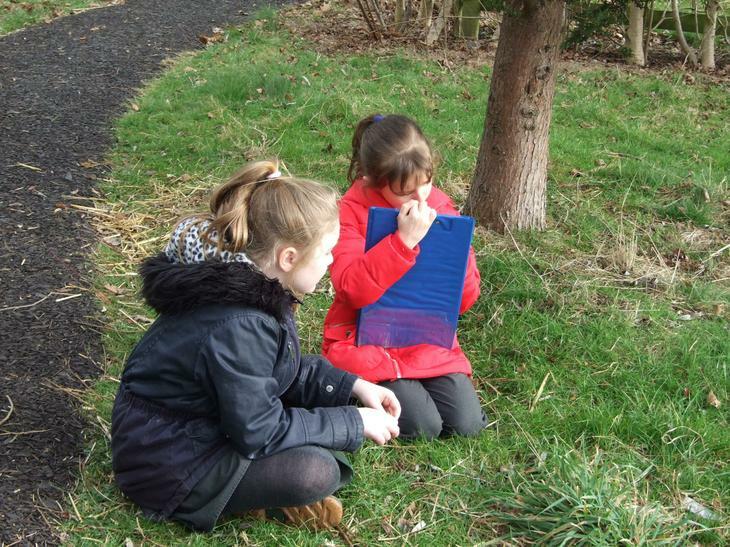 To gain the award the children have to Discover a wild place, Explore it, help to Conserve it and Share their experiences. 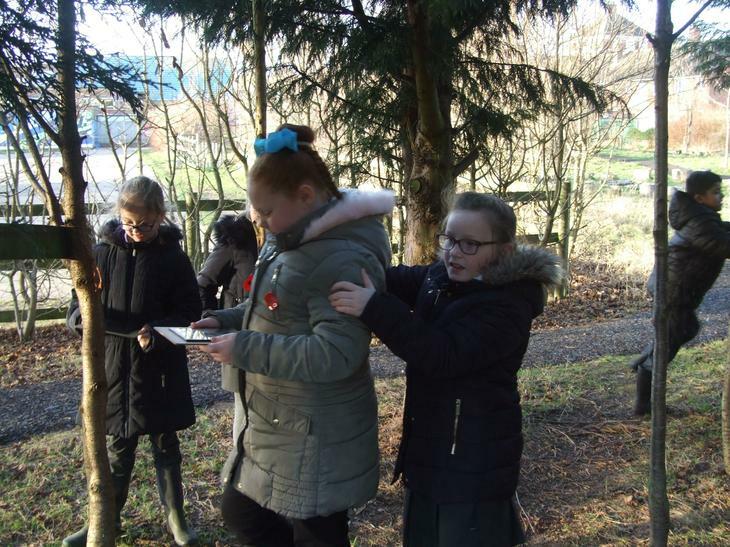 They are also encouraged to work as a team to make a difference to the grounds of Timberley and to find out about the life and work of John Muir who was an early conservationist. 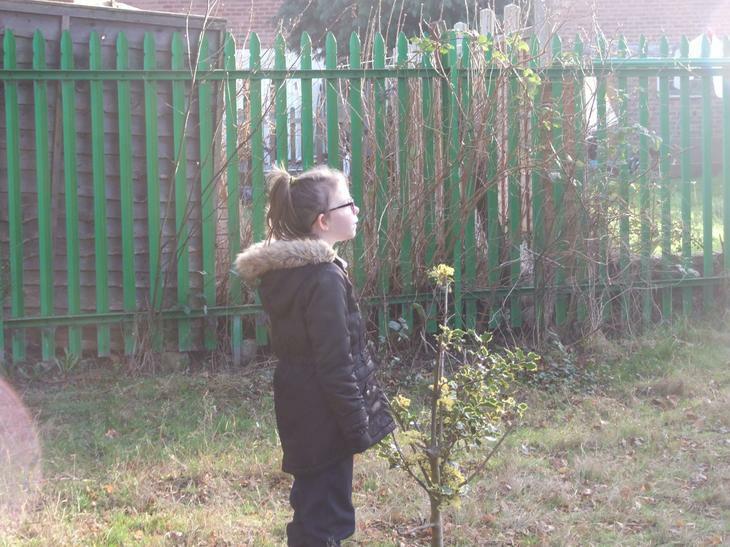 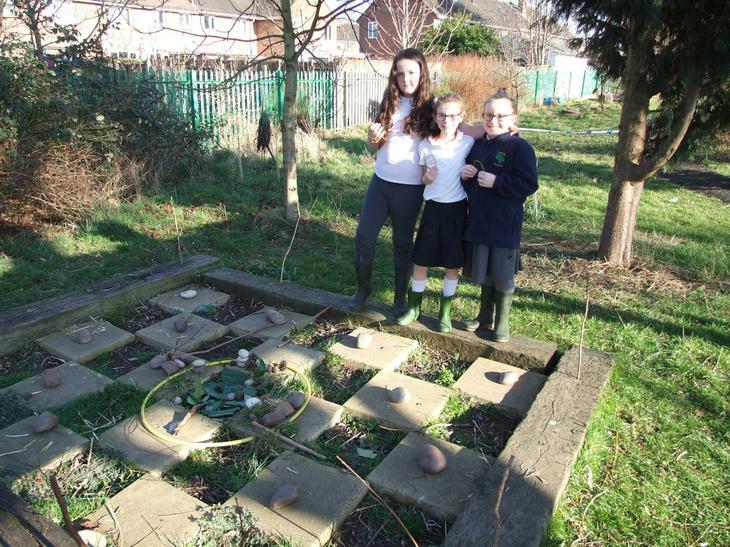 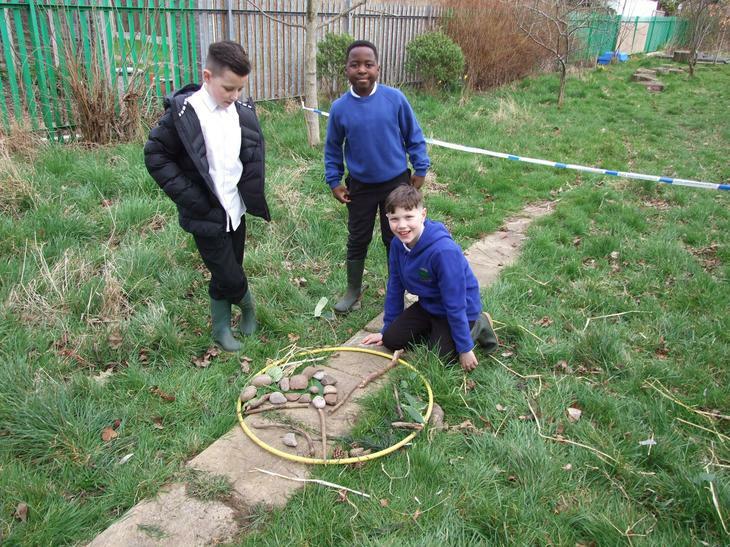 Many of the improvements around the grounds of Timberley Academy have been due to the work of children during their John Muir Awards. 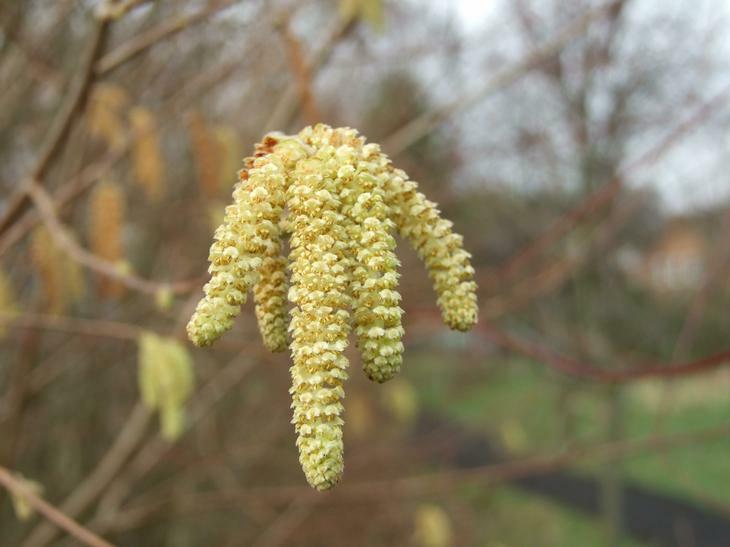 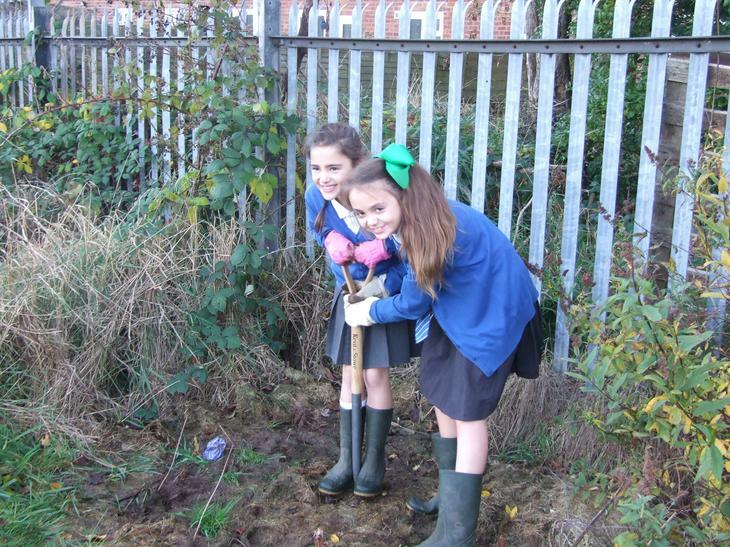 We have planted hundreds of trees, bulbs and wild flowers to enhance the environment for people and wildlife. 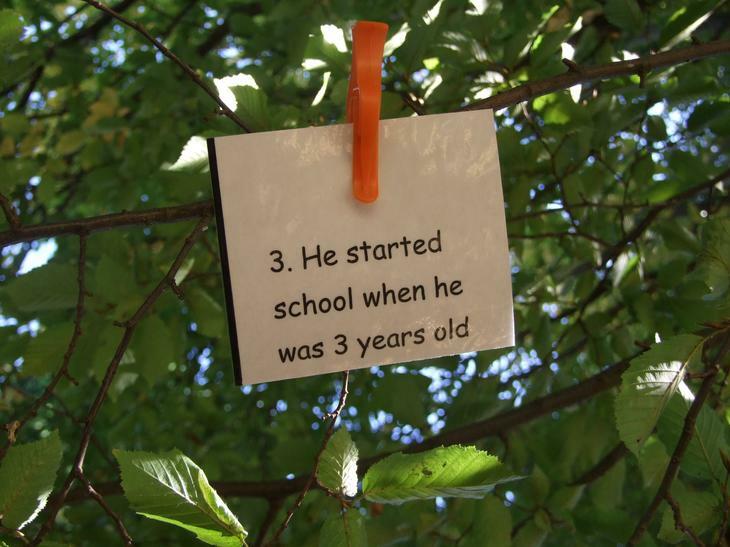 It is important for children to see that they can make a positive contribution to the world around them. 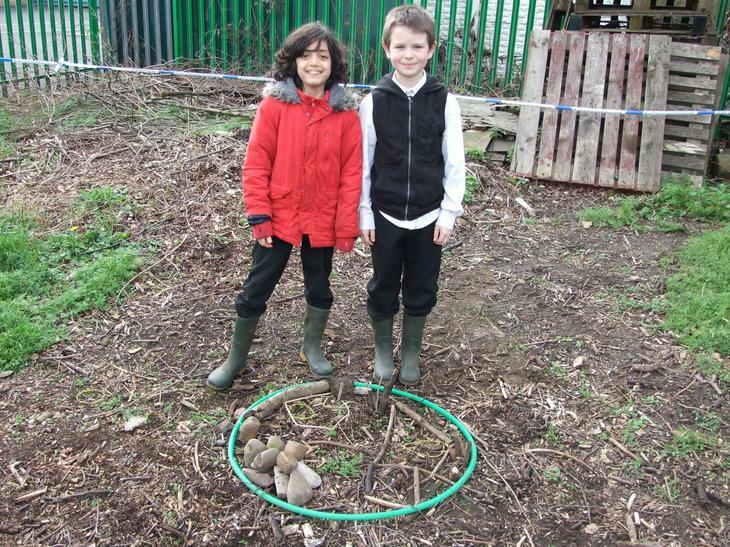 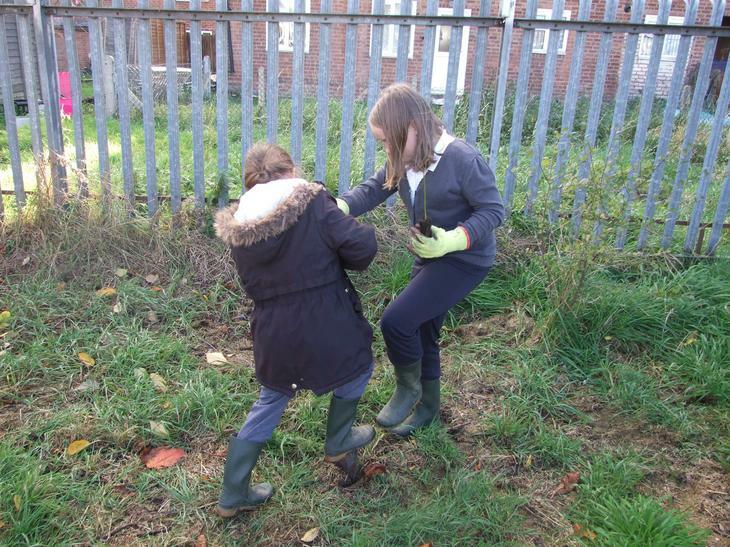 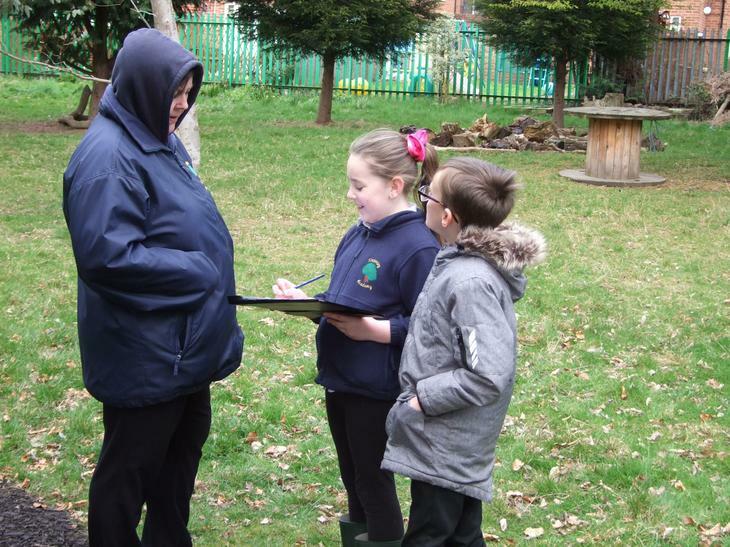 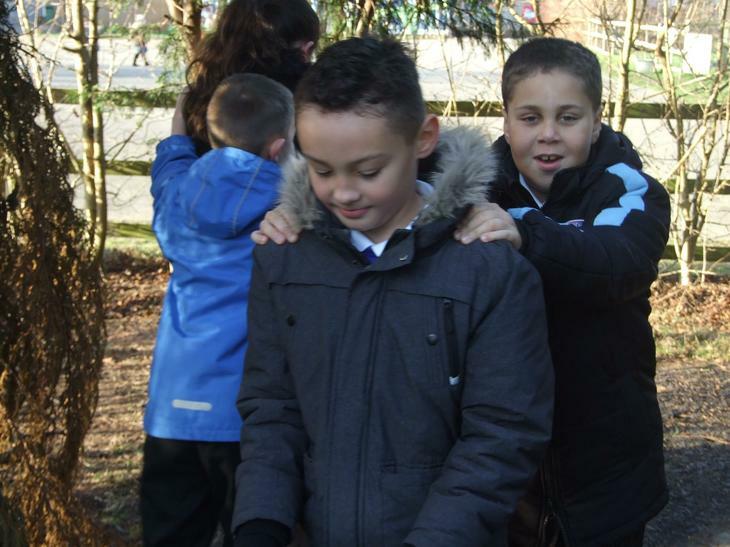 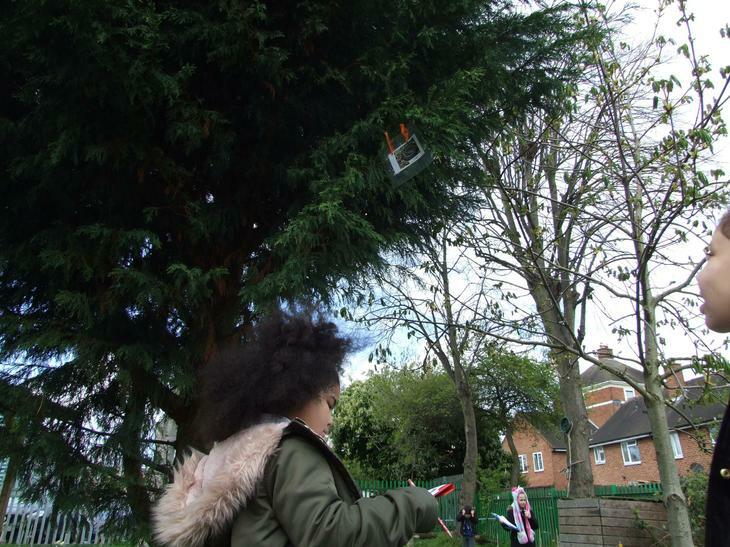 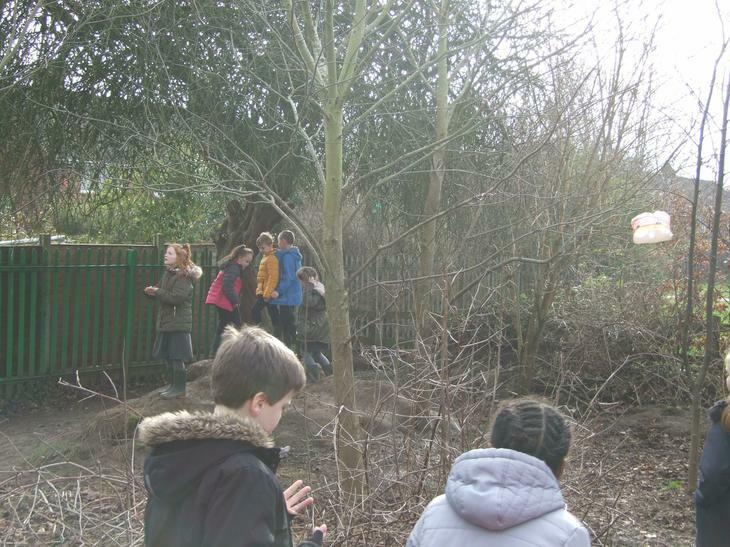 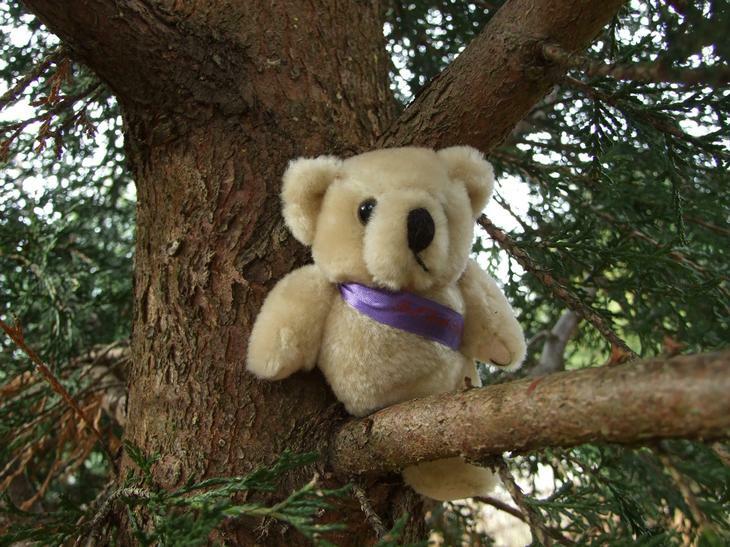 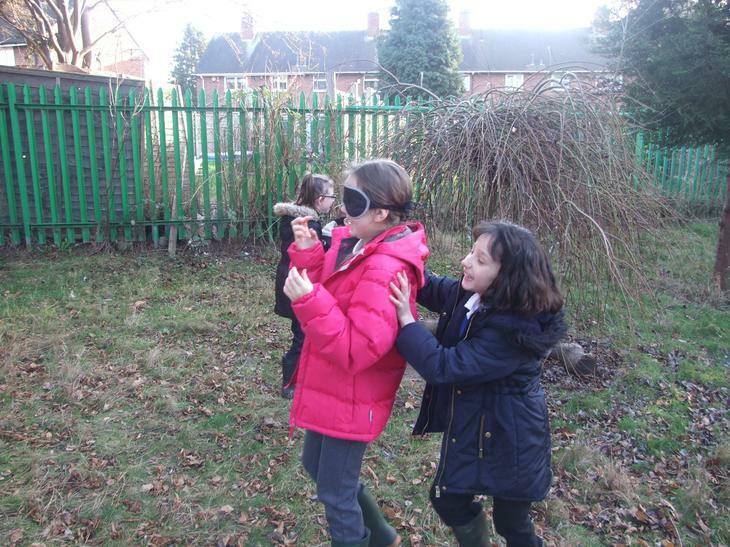 Below you will see photos of the children taking part in activities to help them gain their John Muir Award this year. 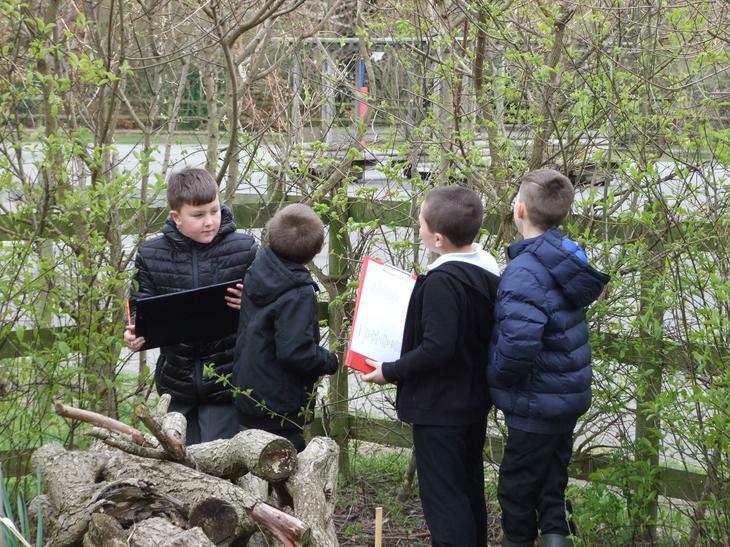 For further information about the John Muir Award or to find out about the life and work of John Muir you can use the links below. 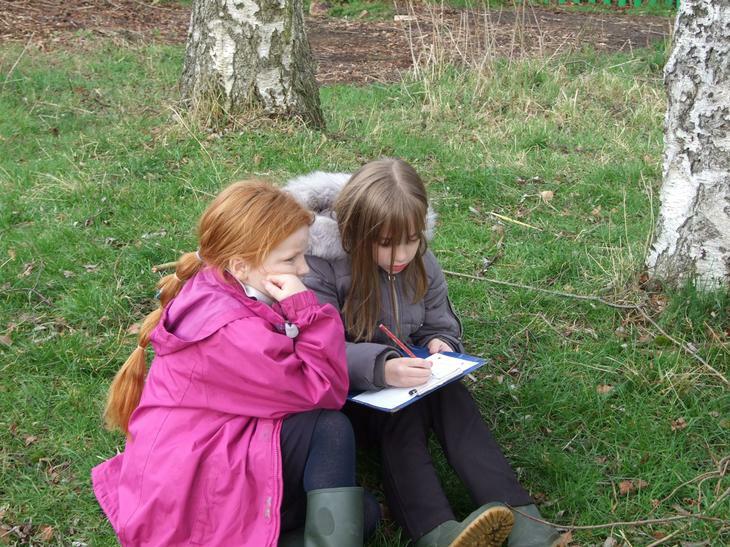 In the first session the children work in pairs. 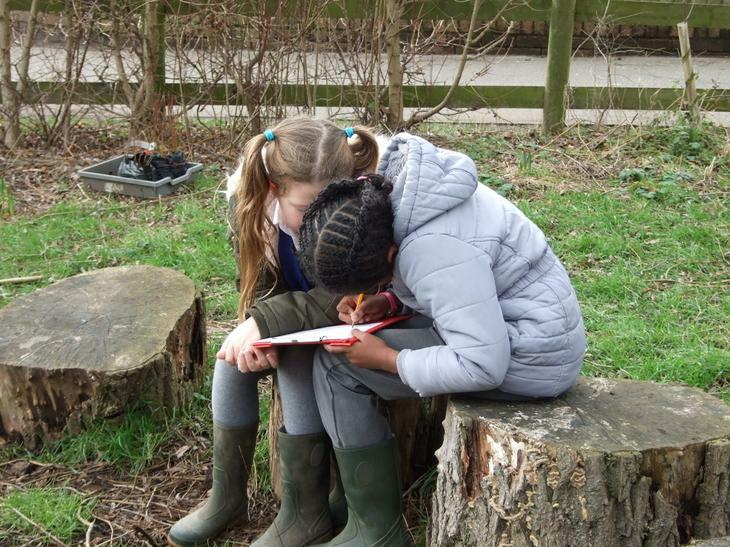 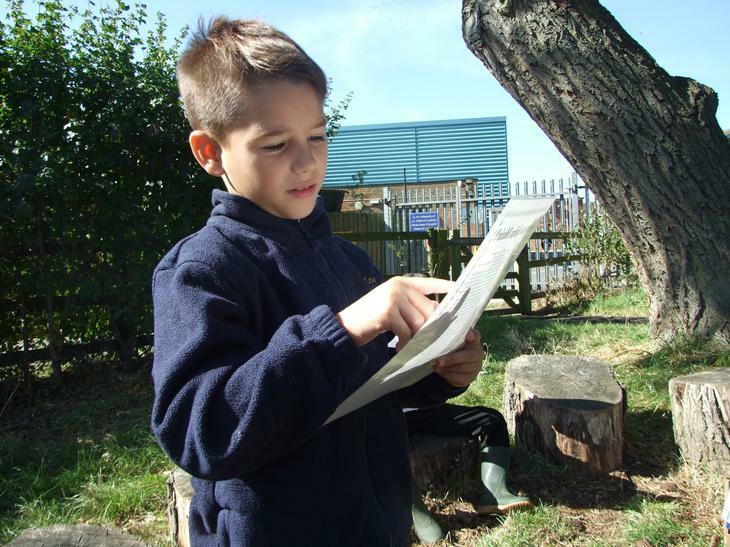 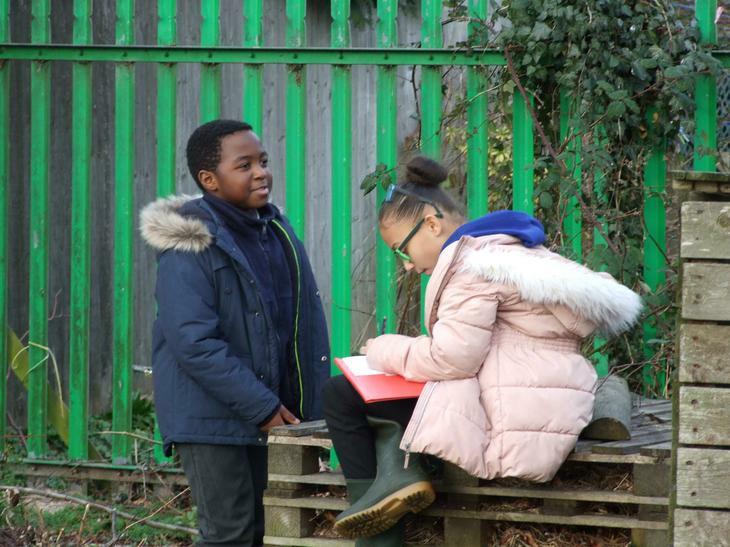 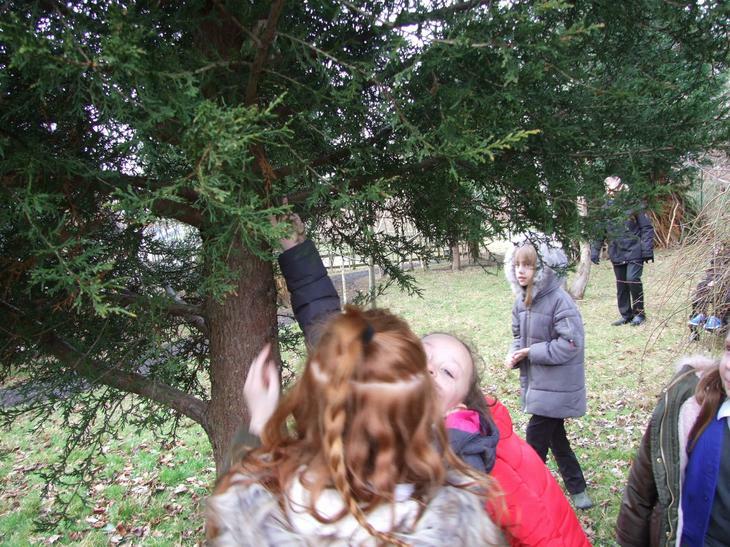 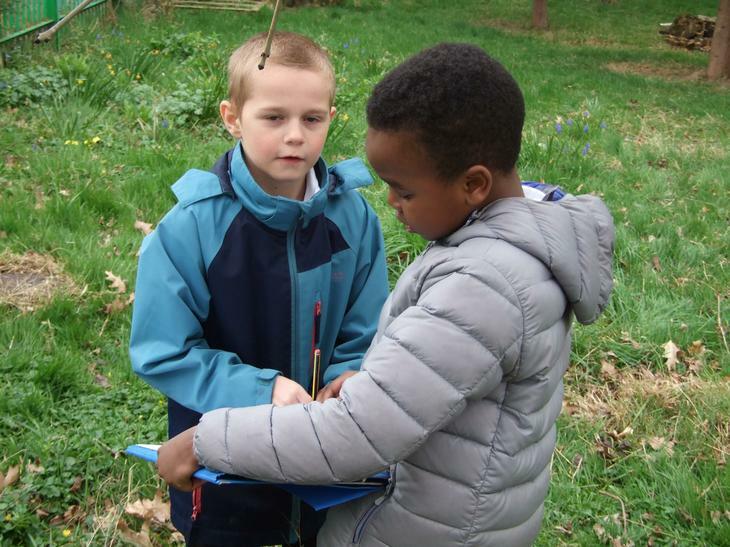 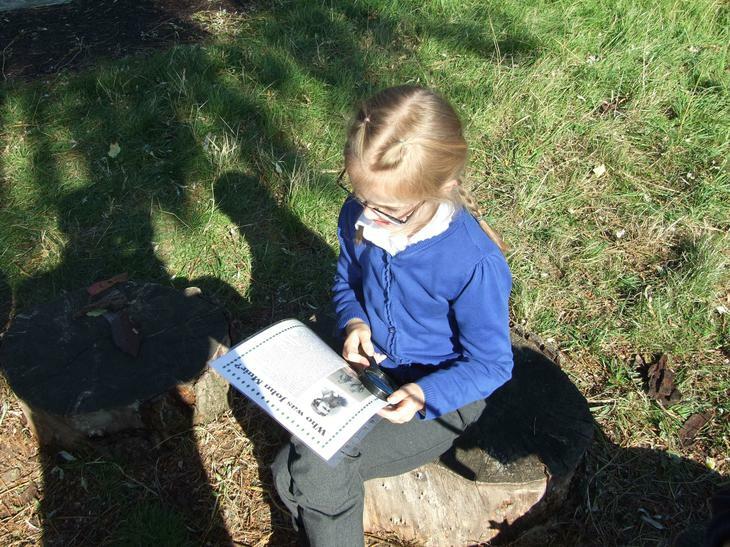 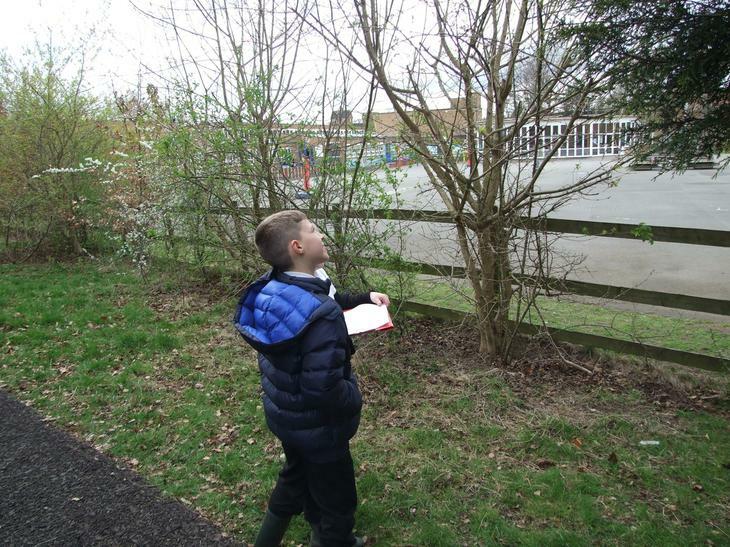 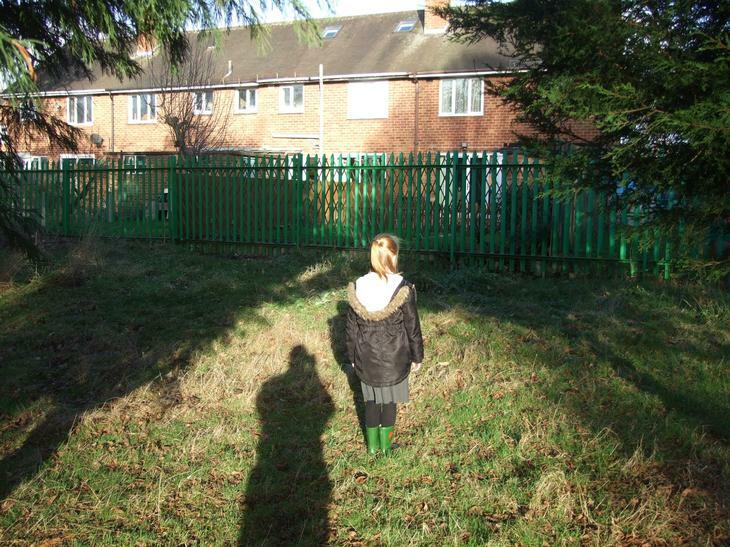 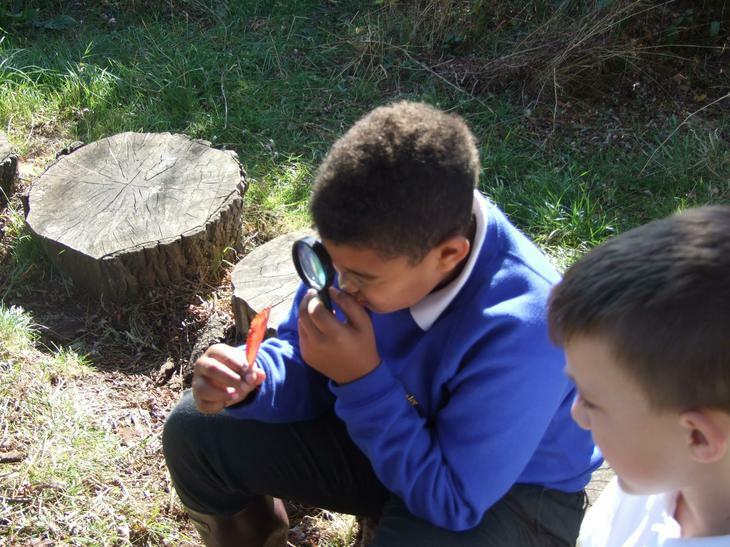 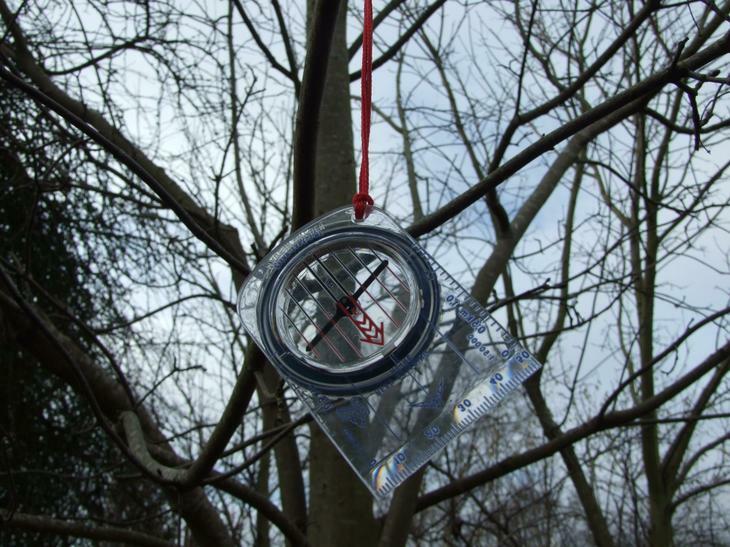 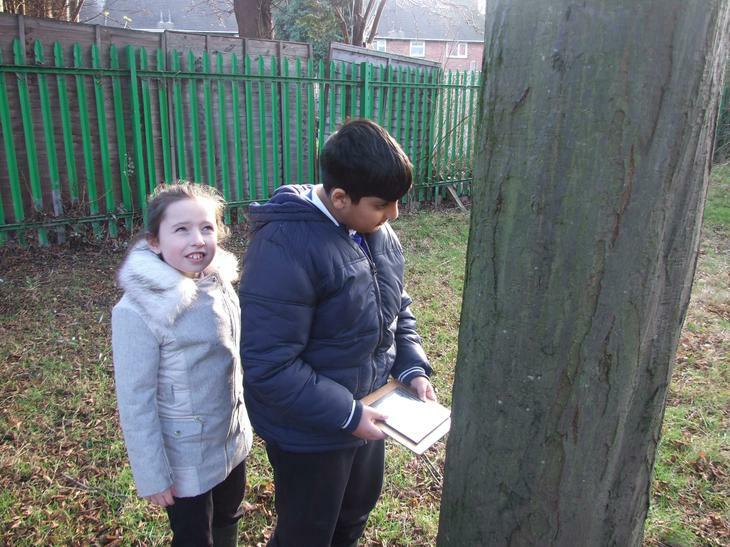 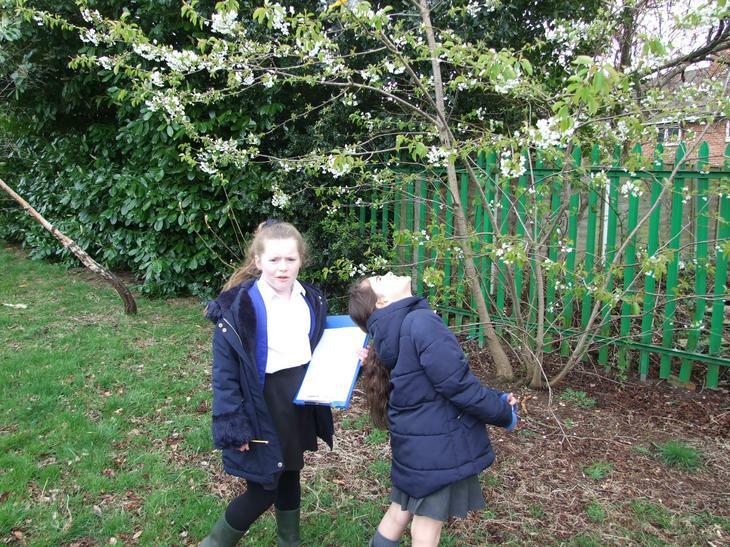 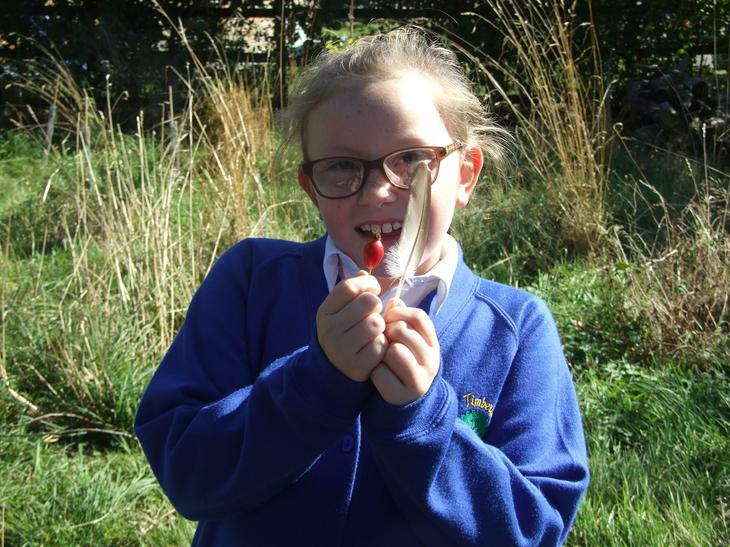 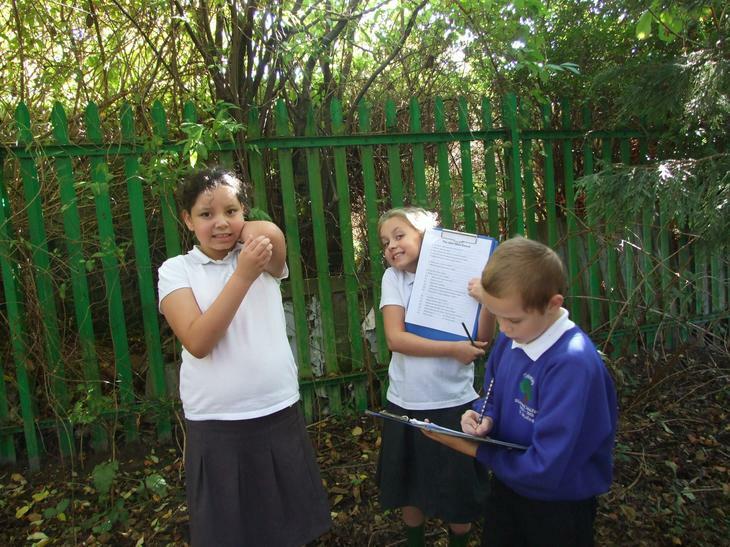 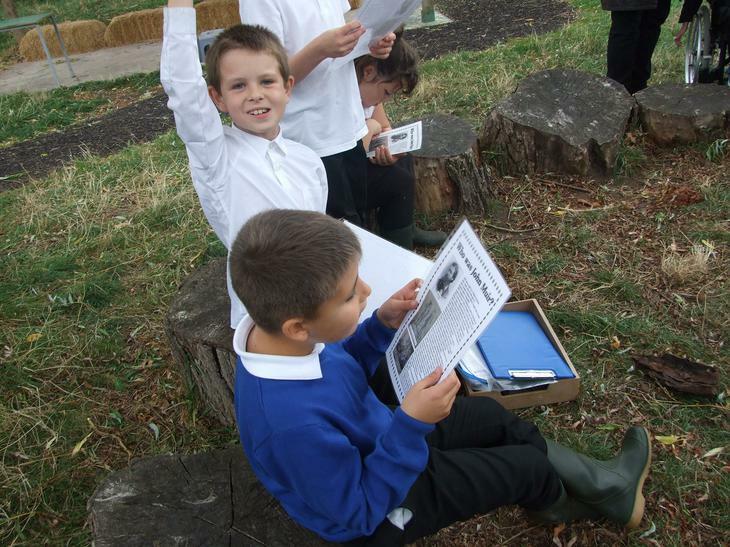 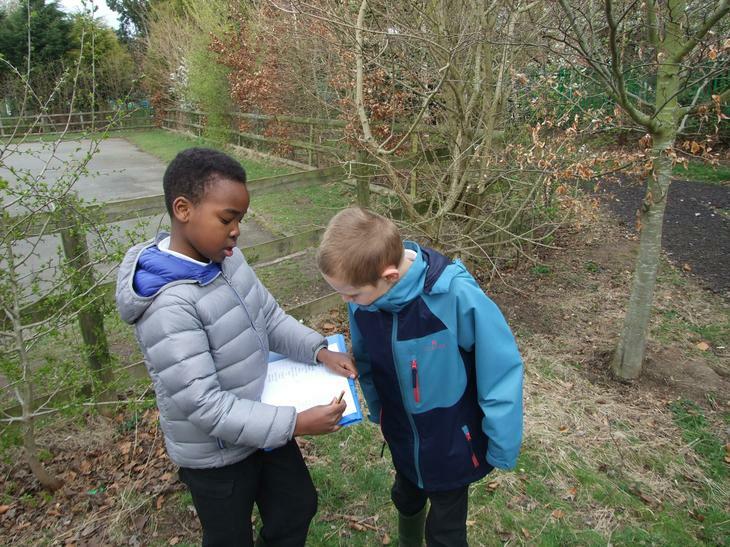 One child explores the Forest School area to find something interesting to show their partner. 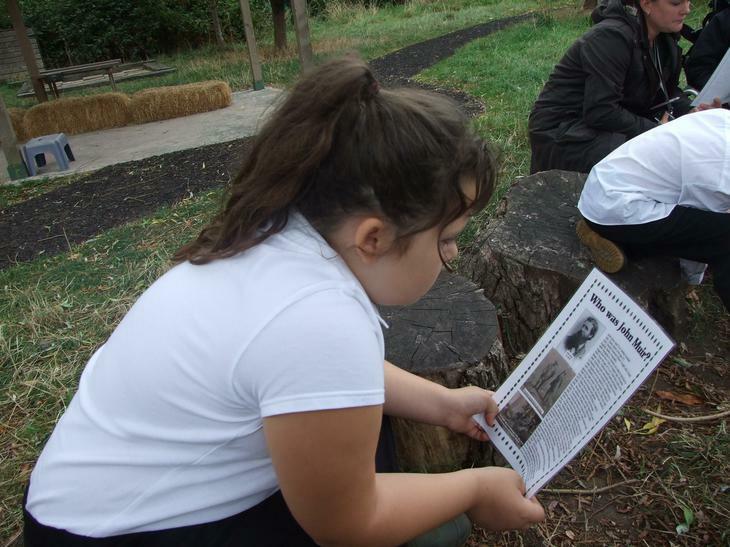 The other child finds out some interesting facts about John Muir to tell their friend. 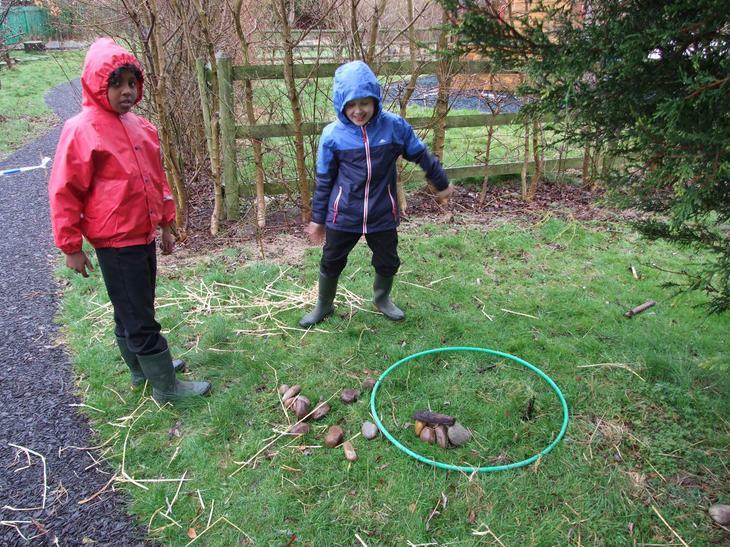 They then swap over so they both get to explore, discover and share what they have found. 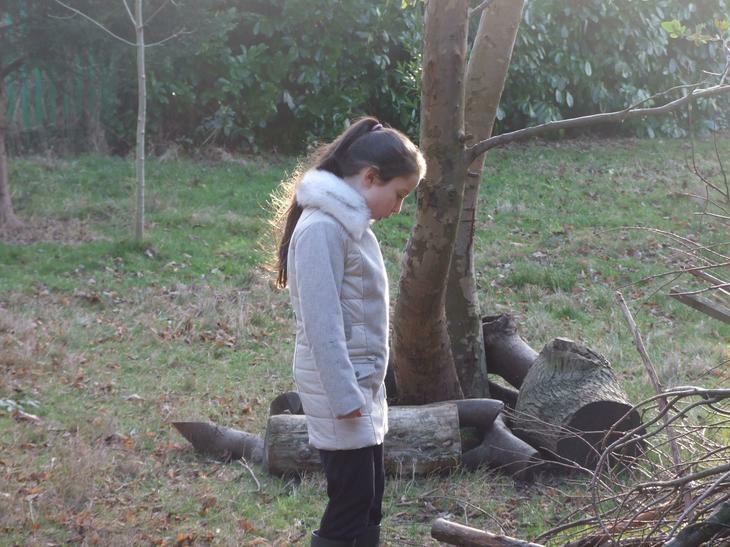 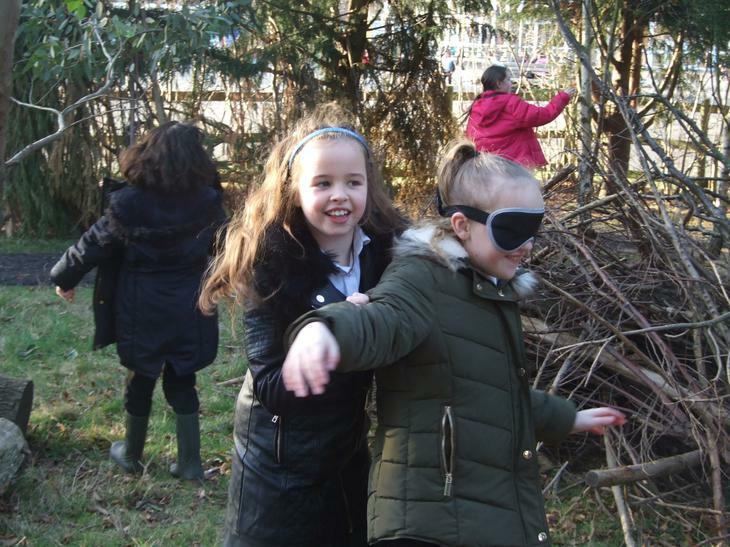 In this session the children work in pairs to explore the Forest School area and discover the answers to questions about John Muir hidden around the grounds. 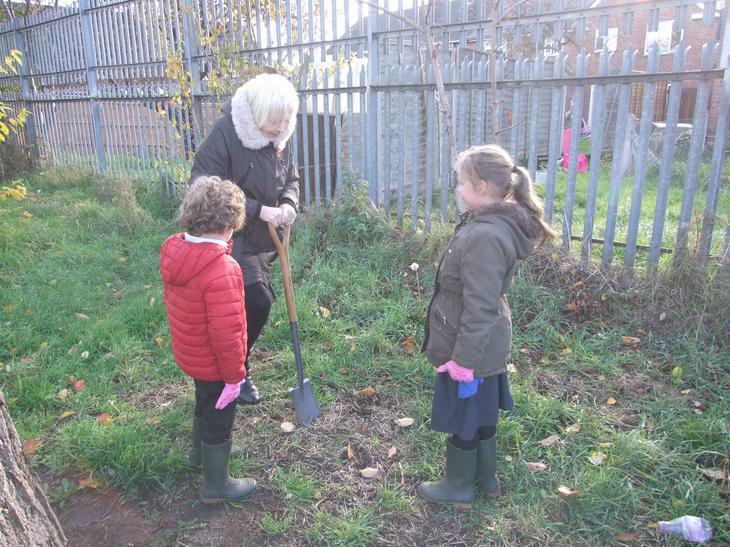 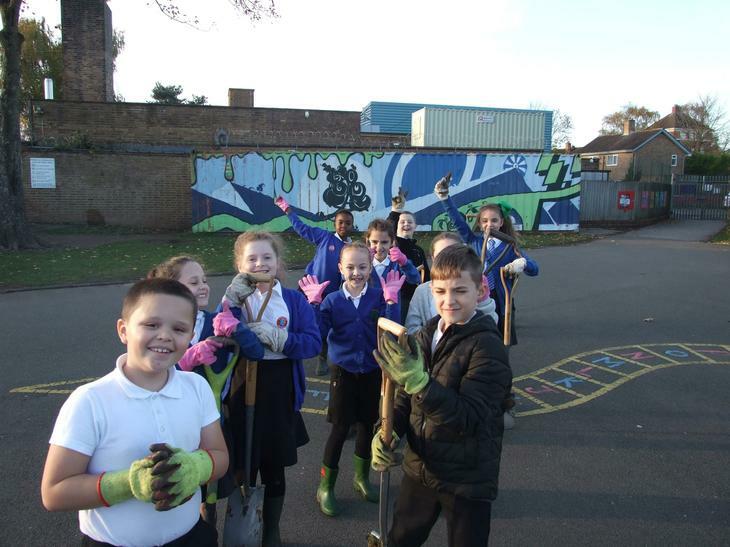 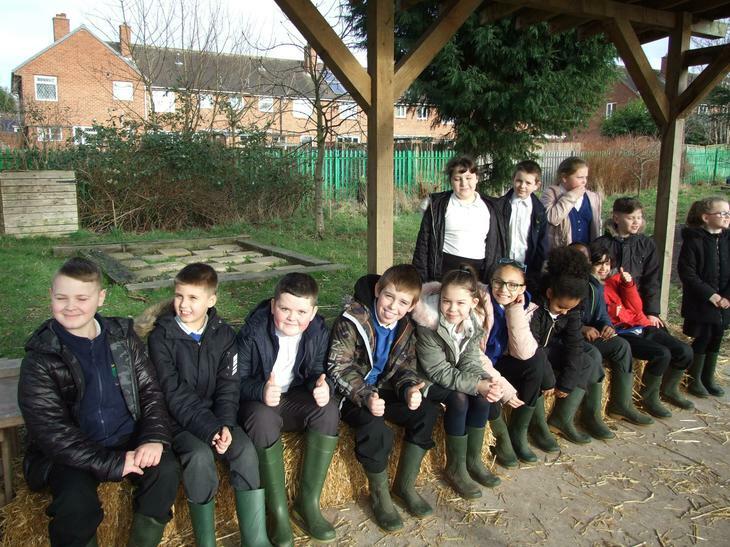 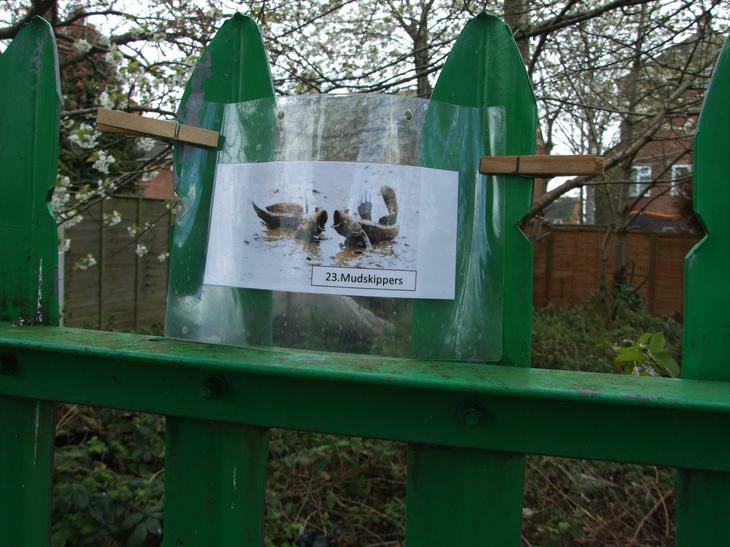 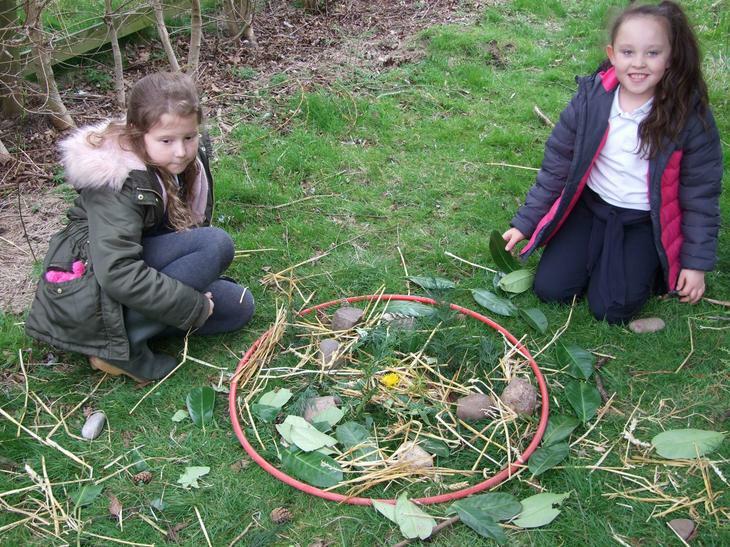 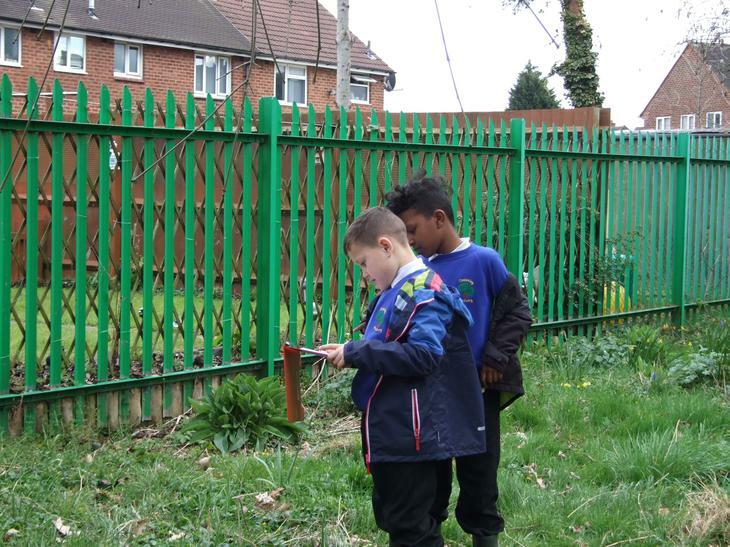 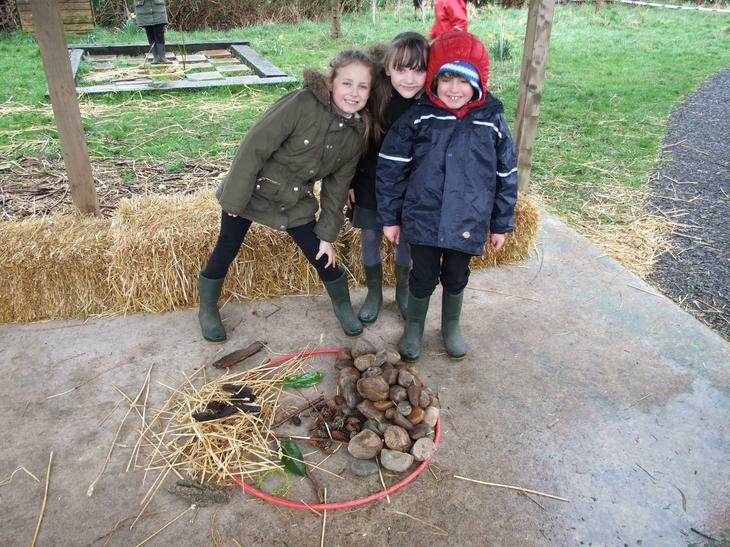 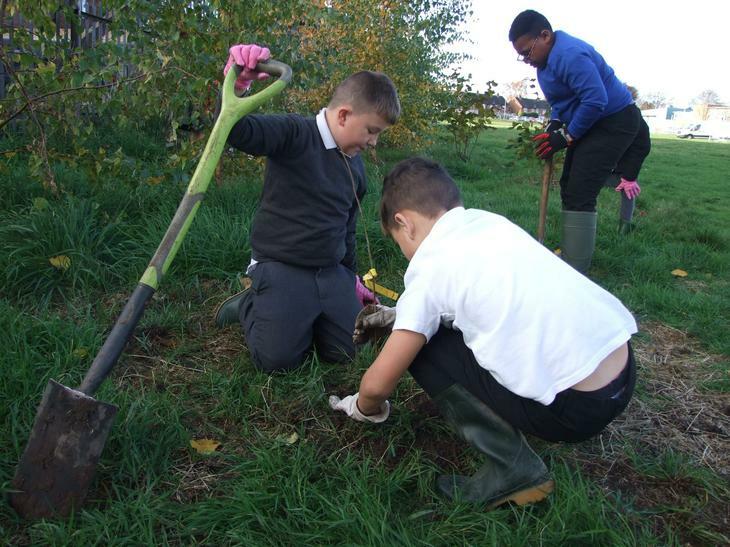 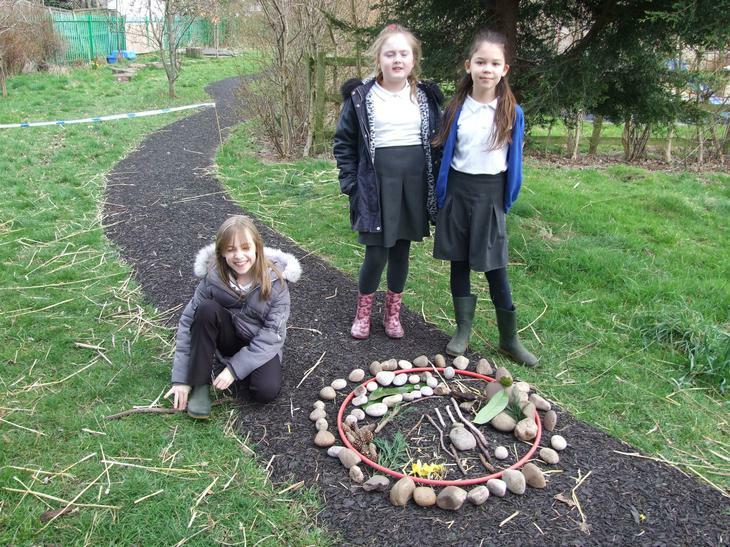 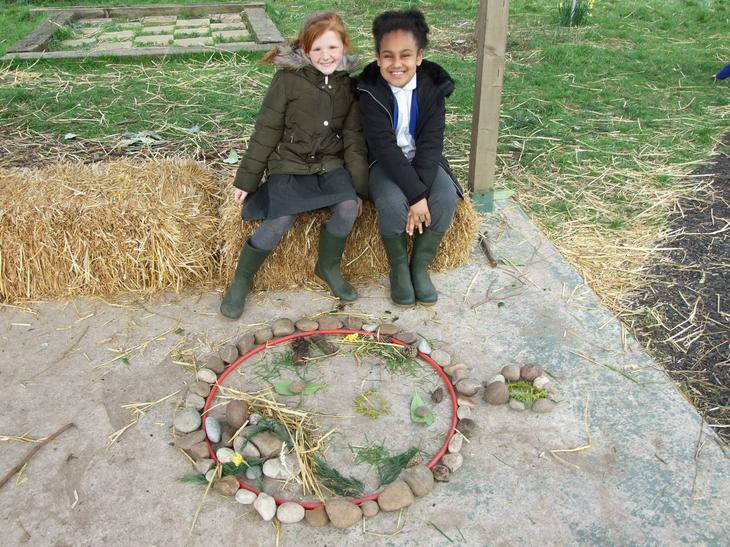 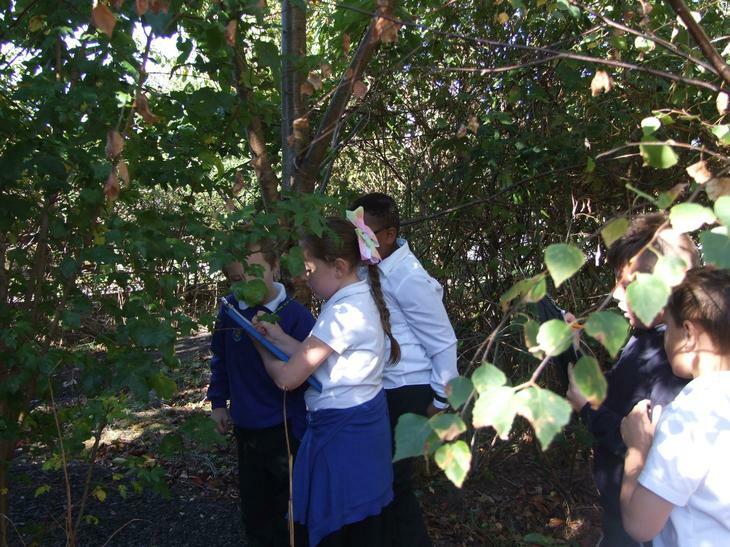 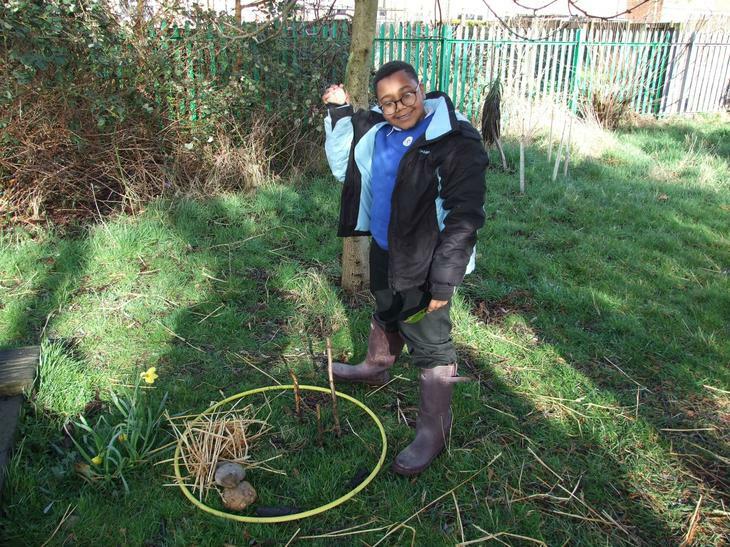 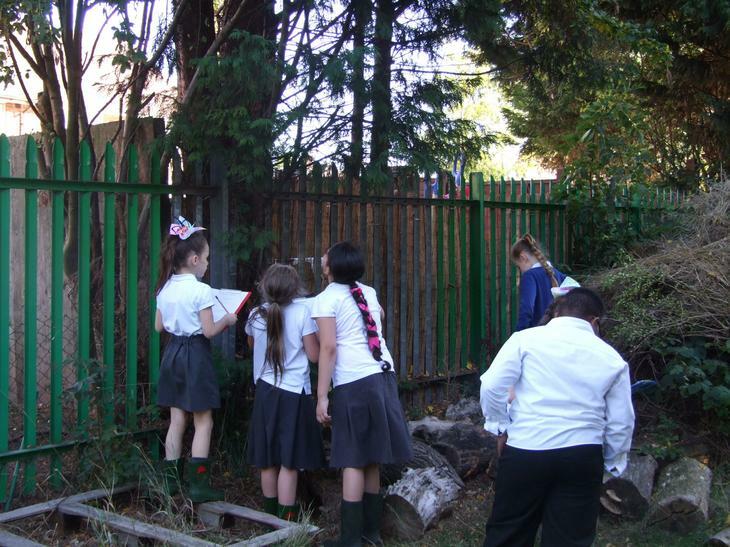 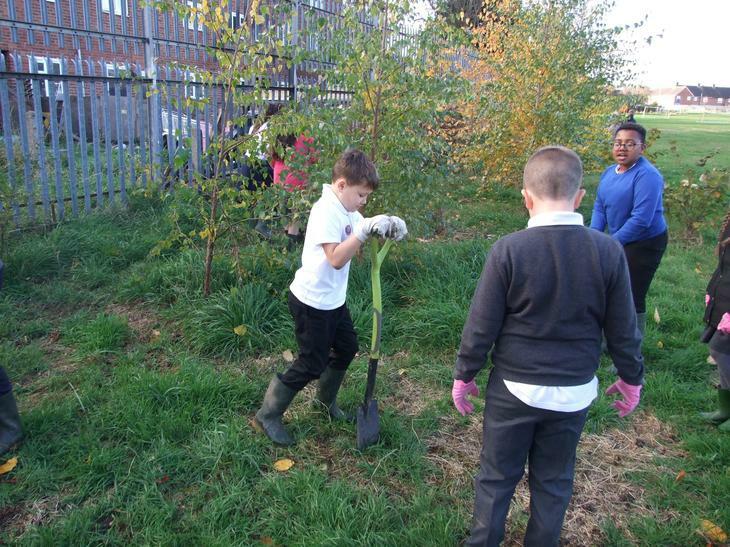 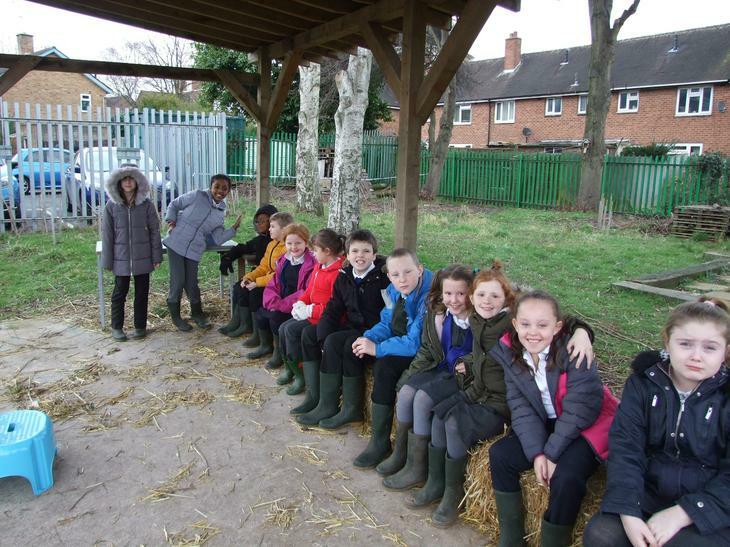 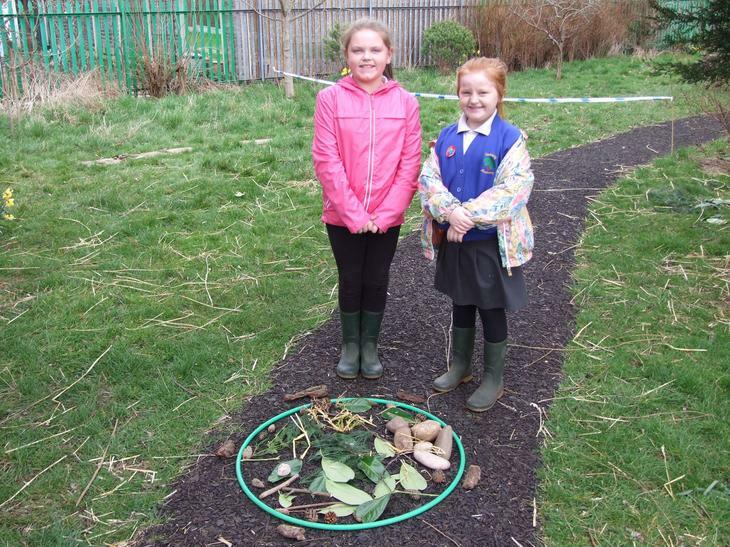 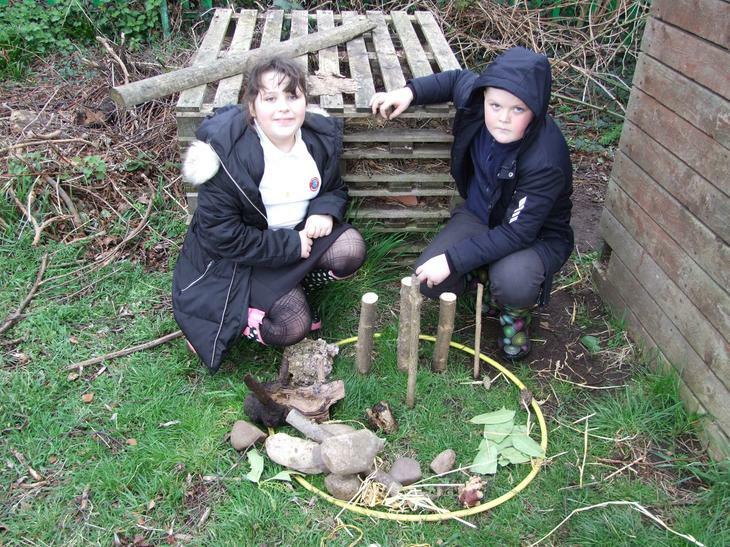 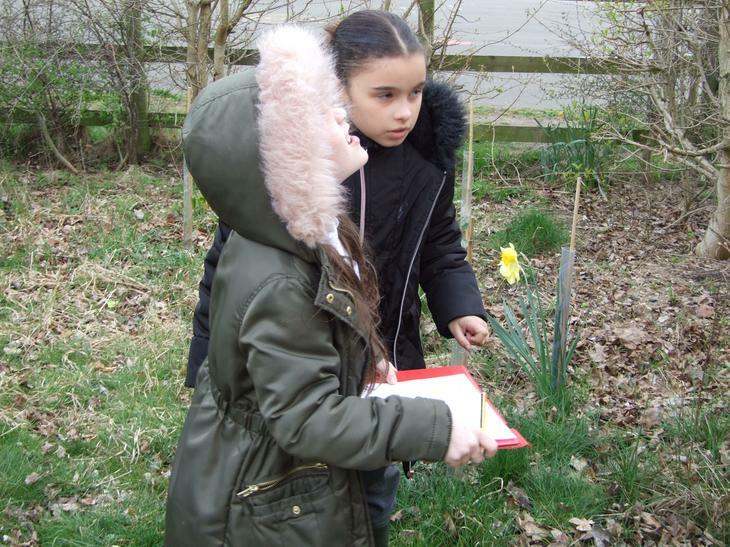 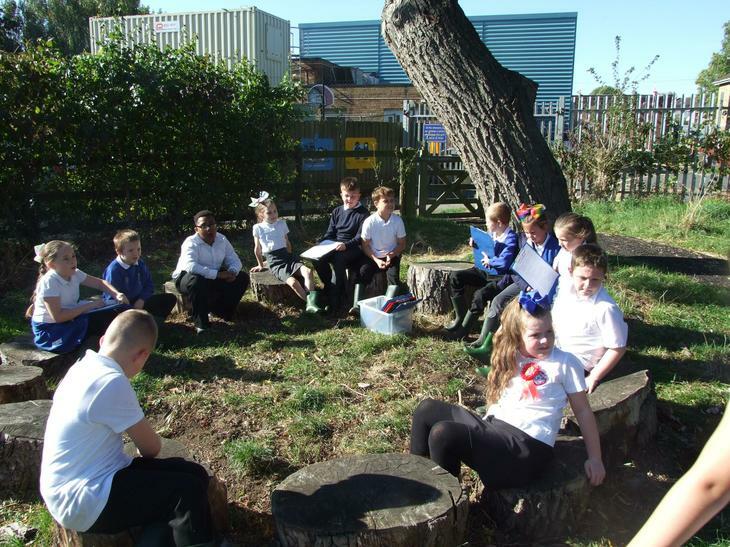 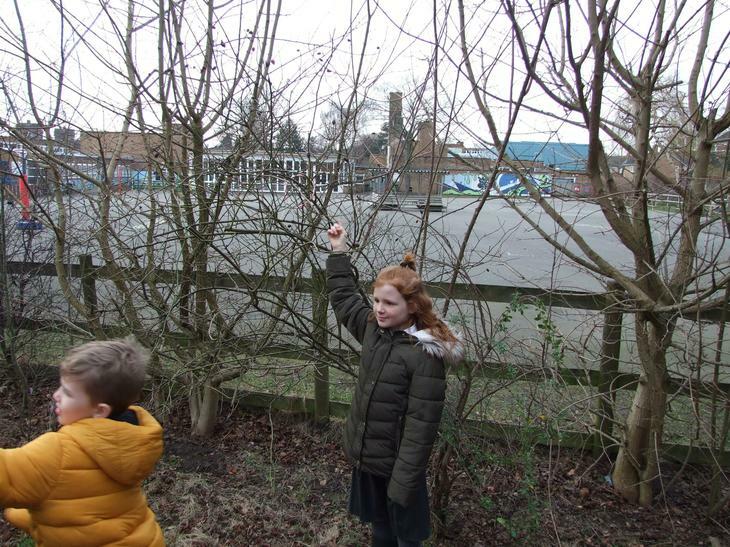 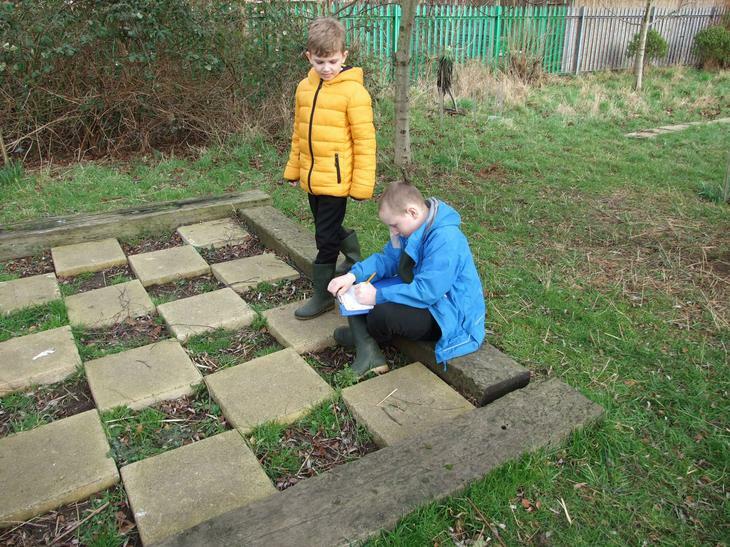 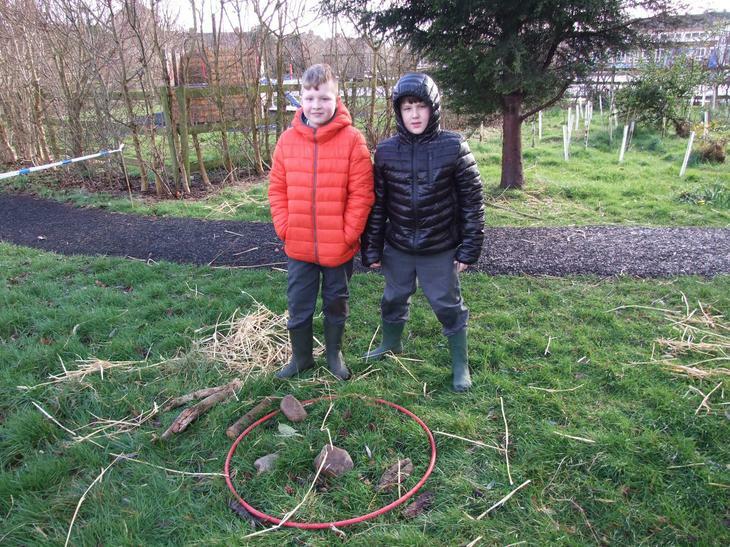 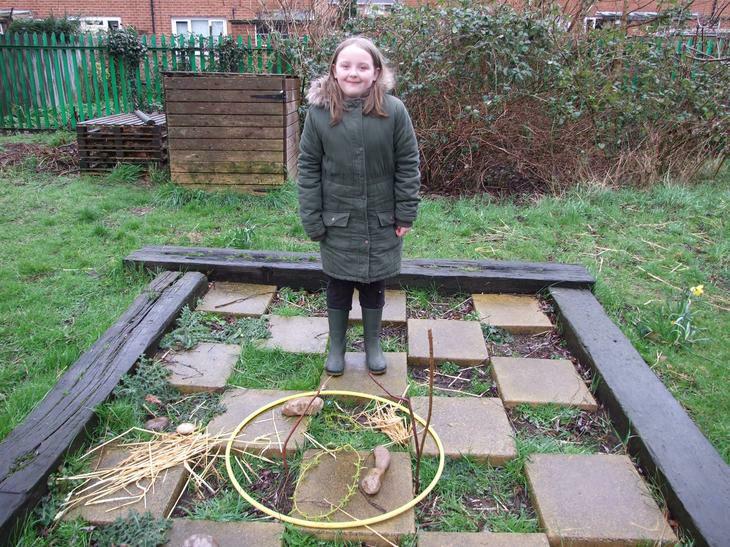 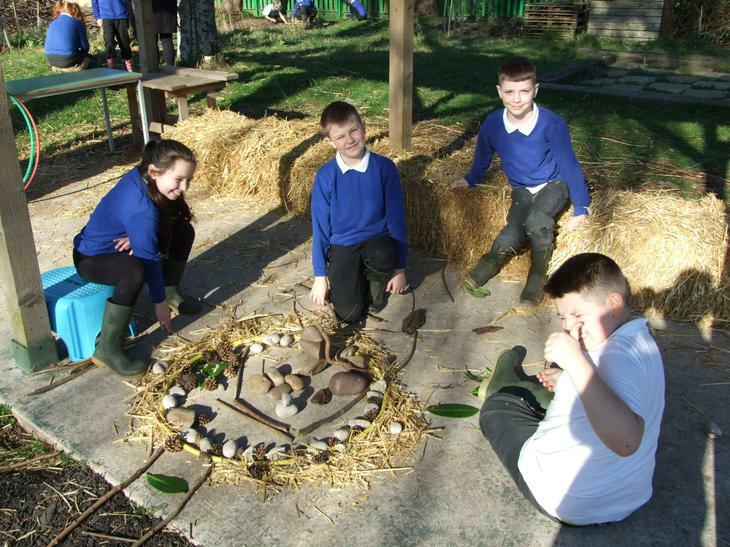 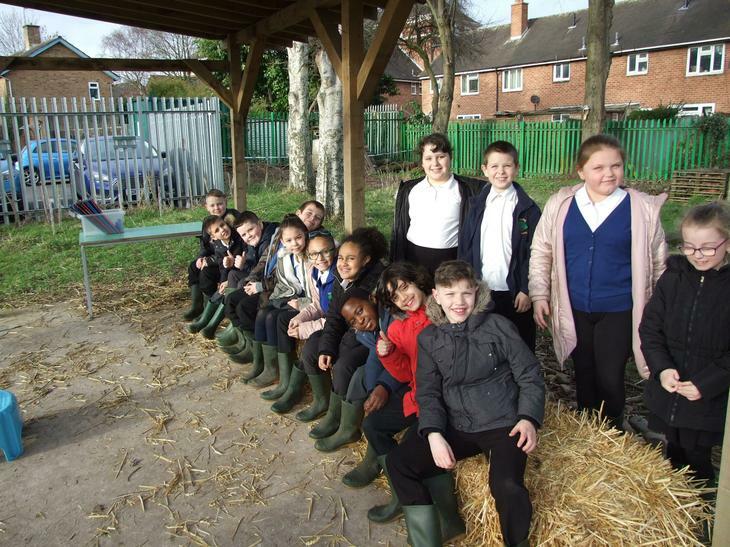 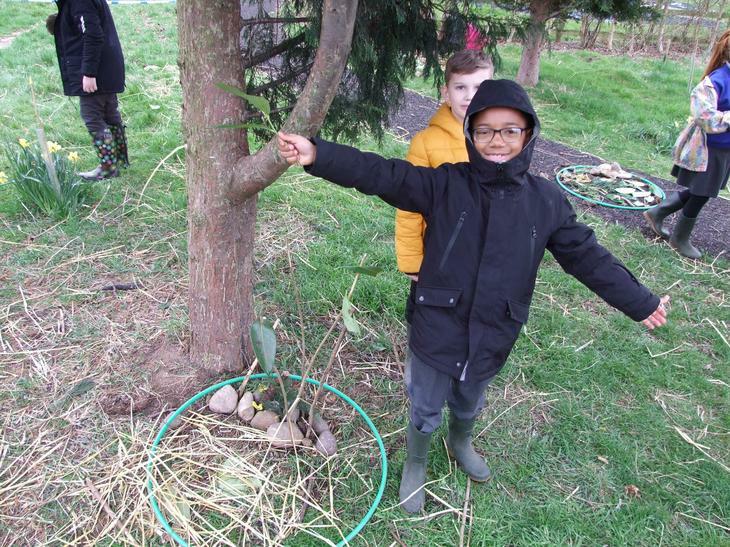 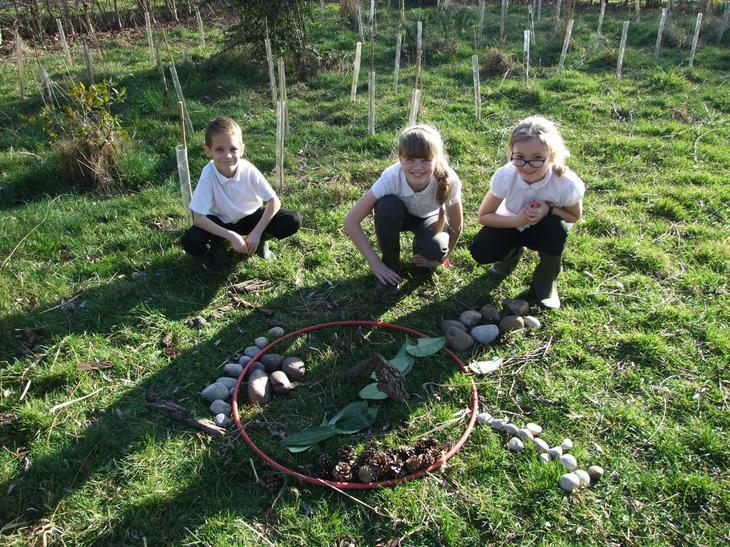 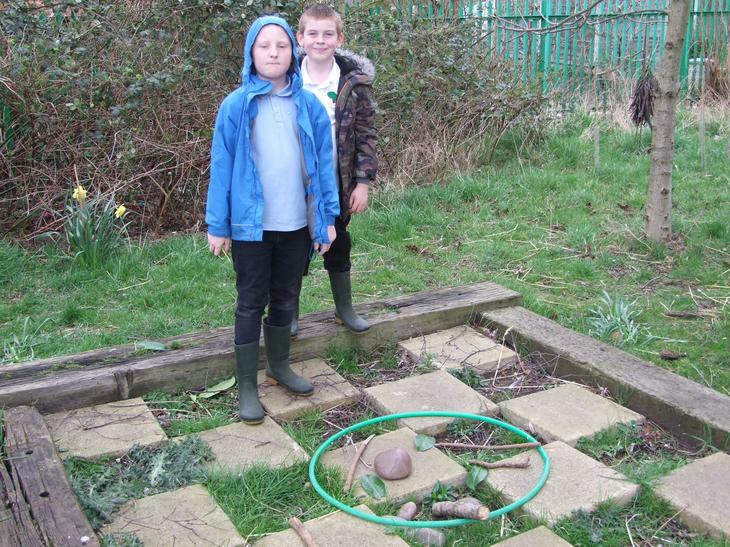 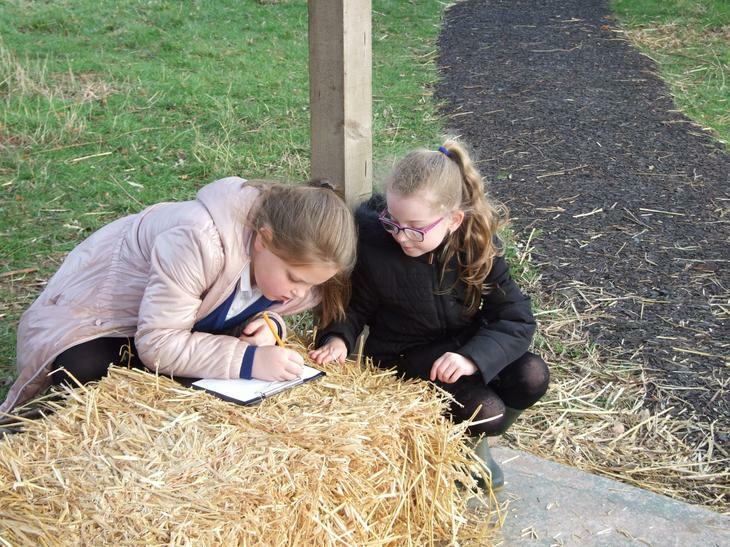 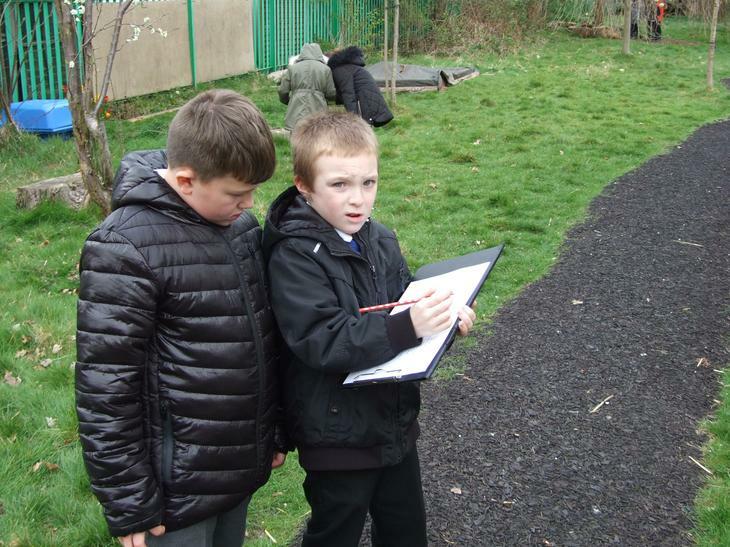 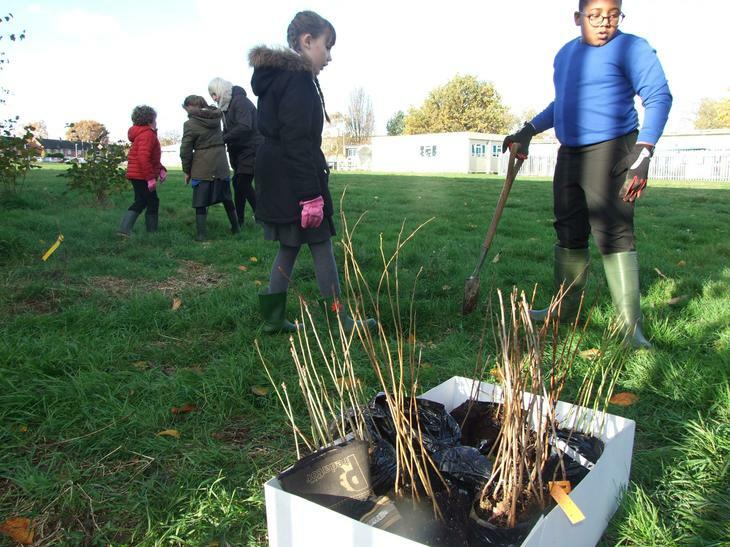 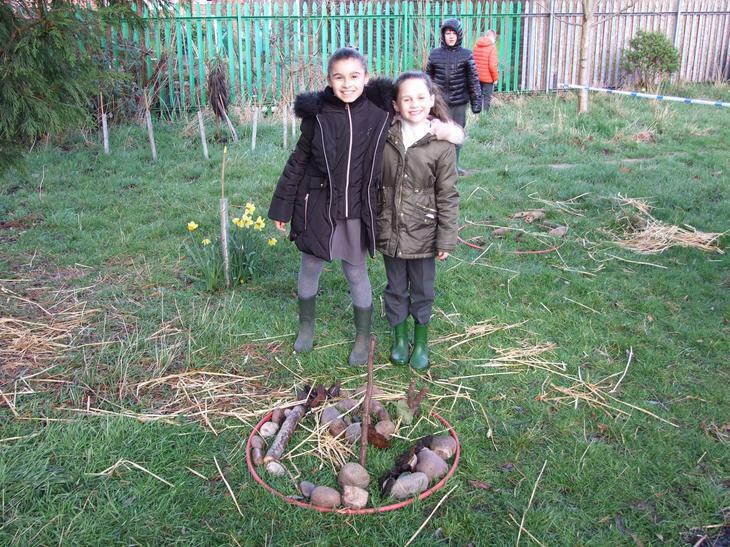 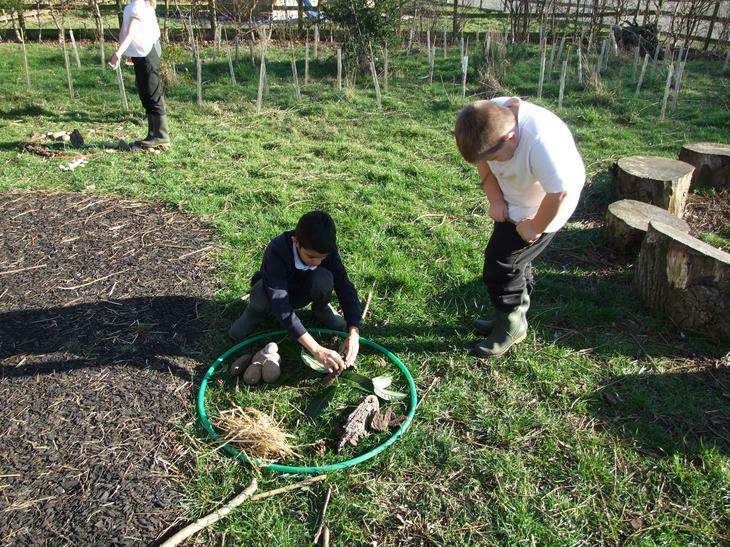 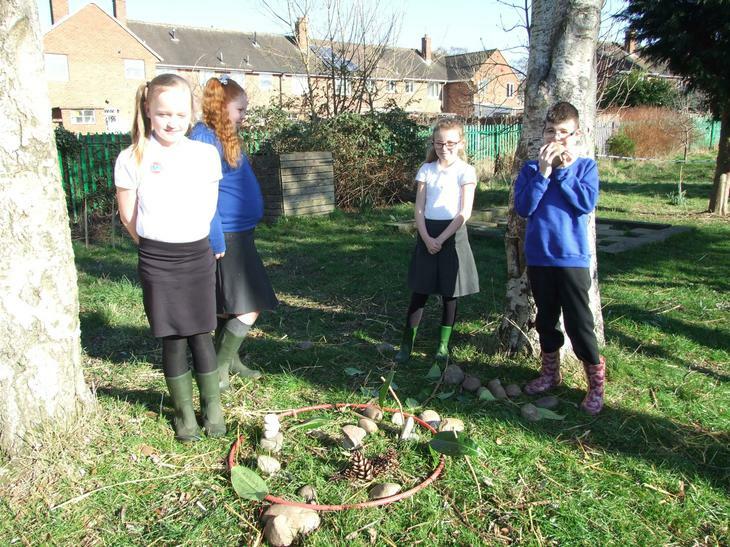 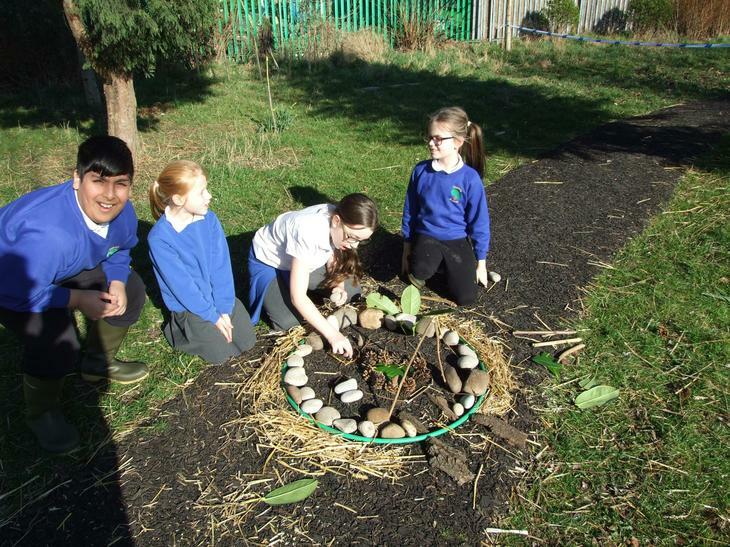 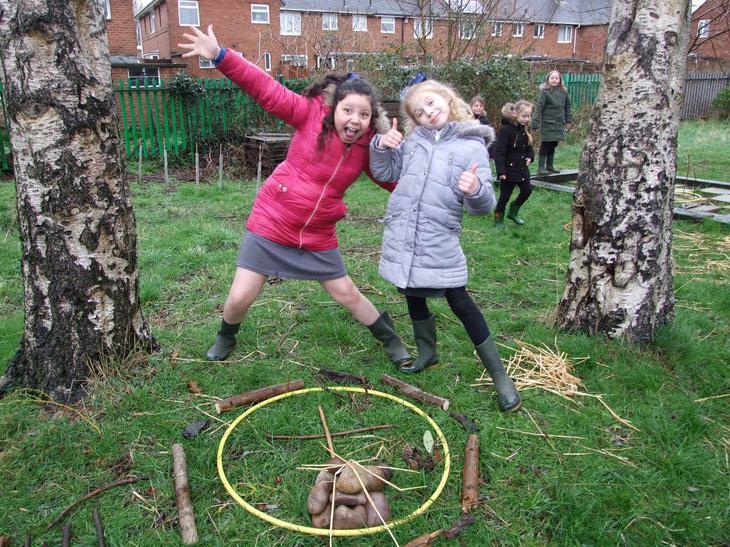 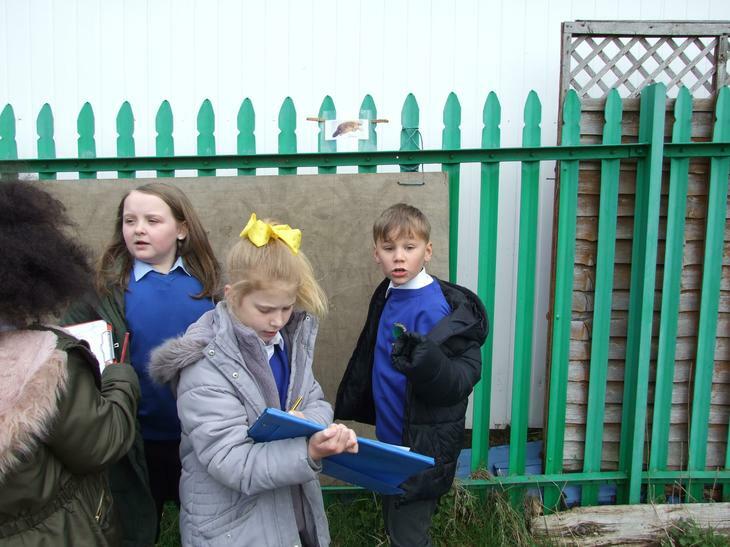 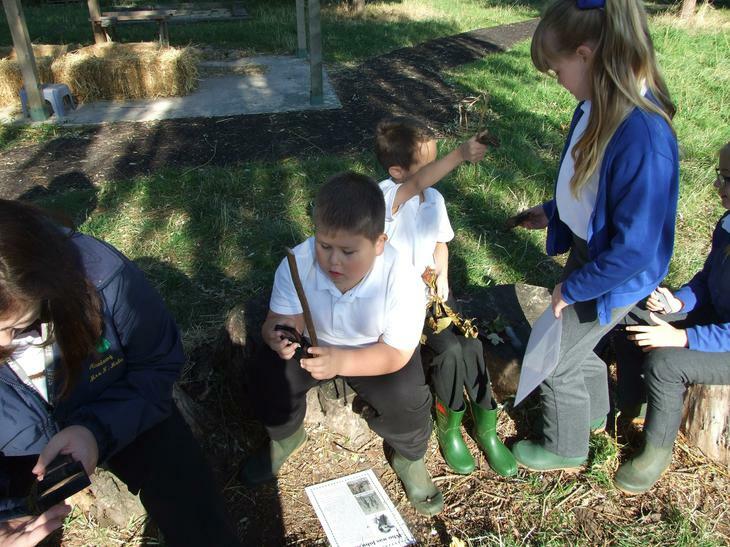 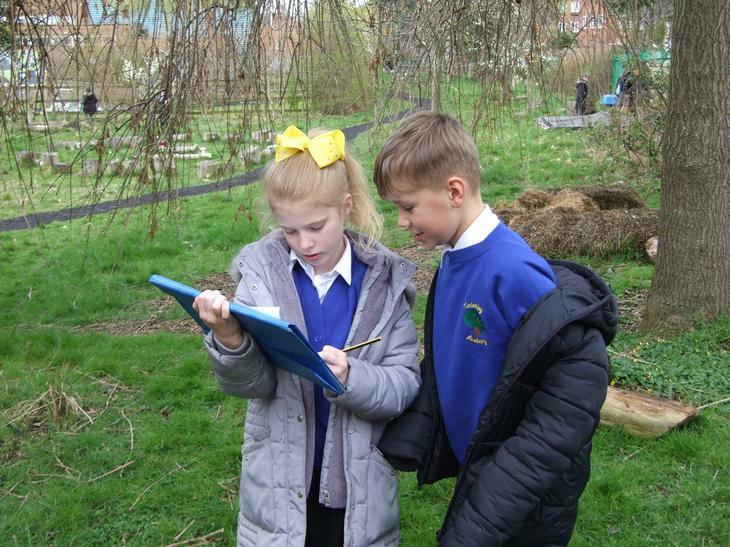 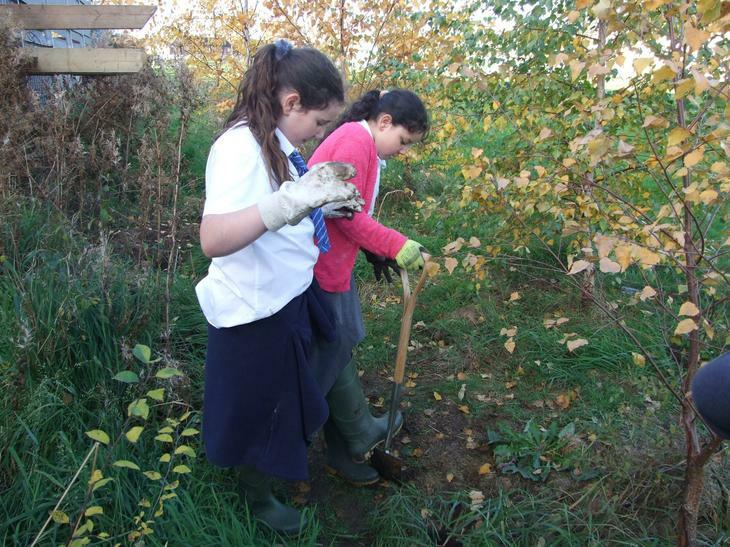 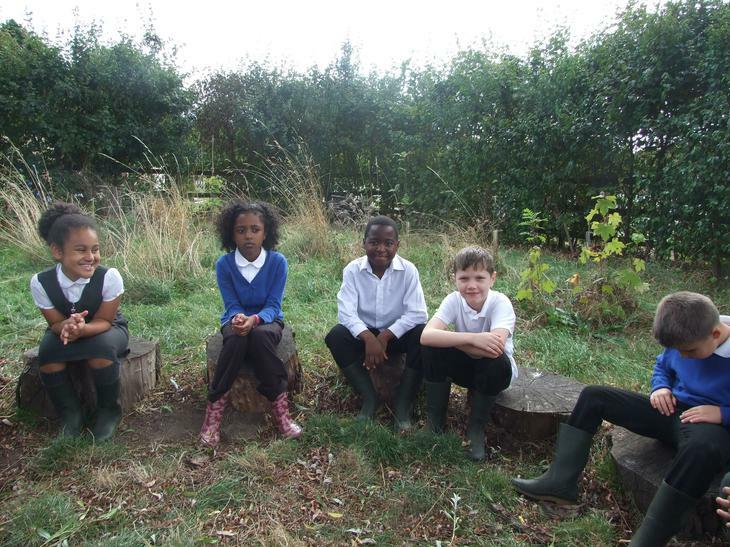 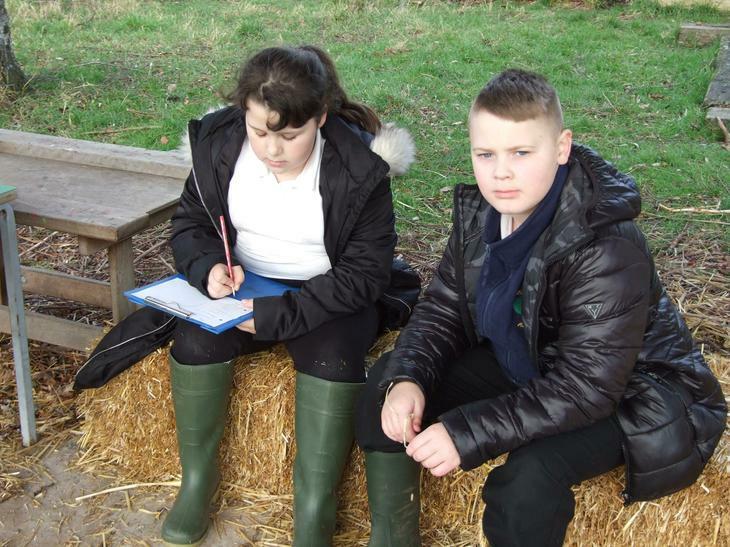 As part of their John Muir Award the children are expected to do something that helps to improve the environment and make it better for wildlife. 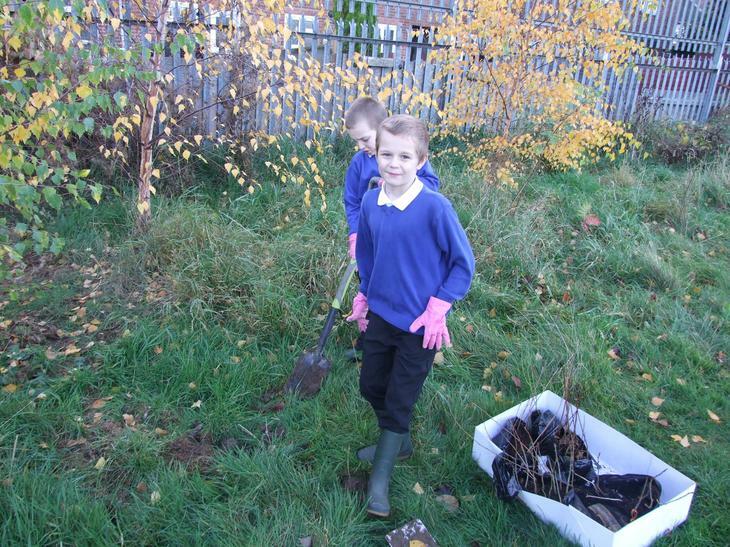 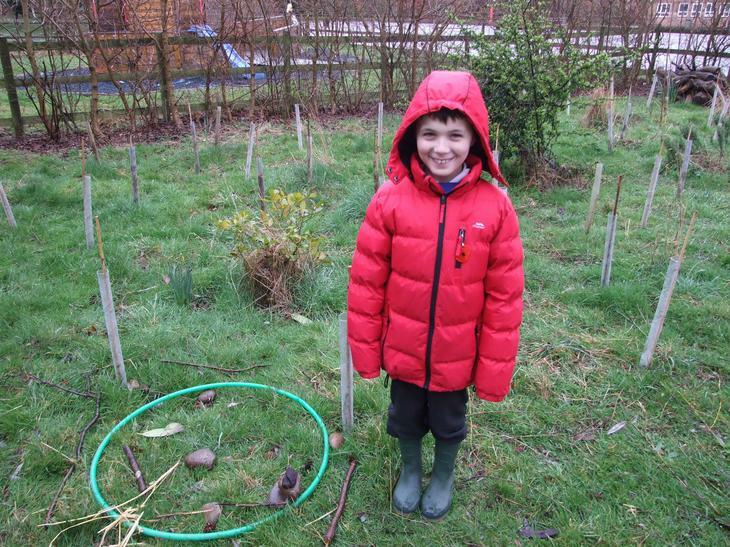 The Woodland Trust supplies trees for schools so we are now planting them around the grounds. 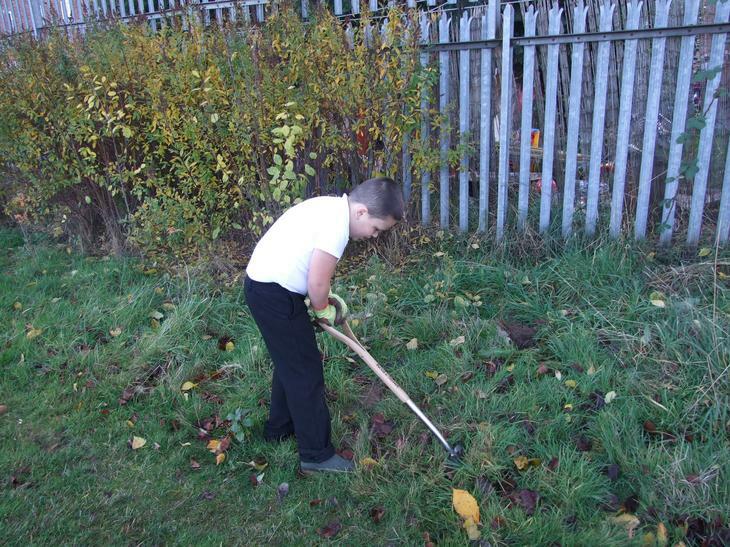 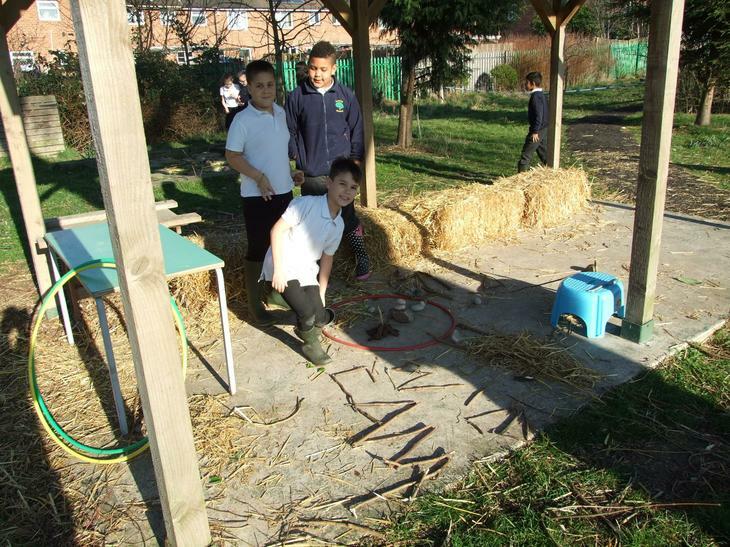 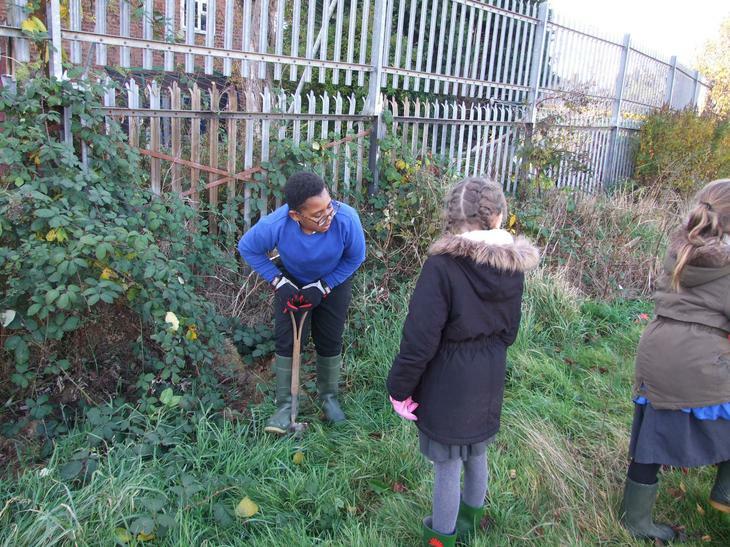 It is nice for the children to make a positive difference to the world around them and improve the school grounds. 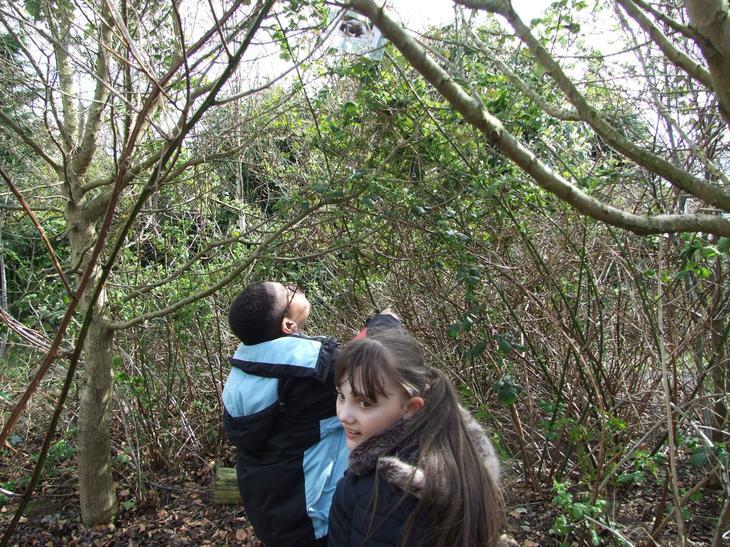 As the children grow up into adults the trees will also grow proving homes and food for wildlife. 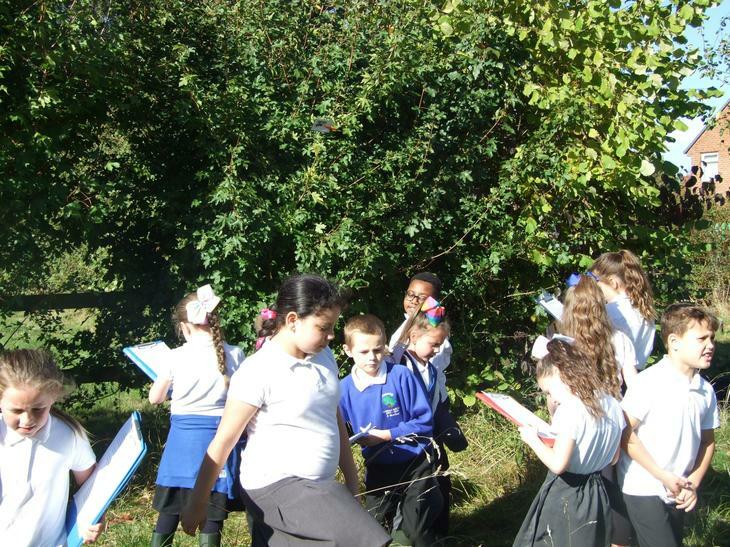 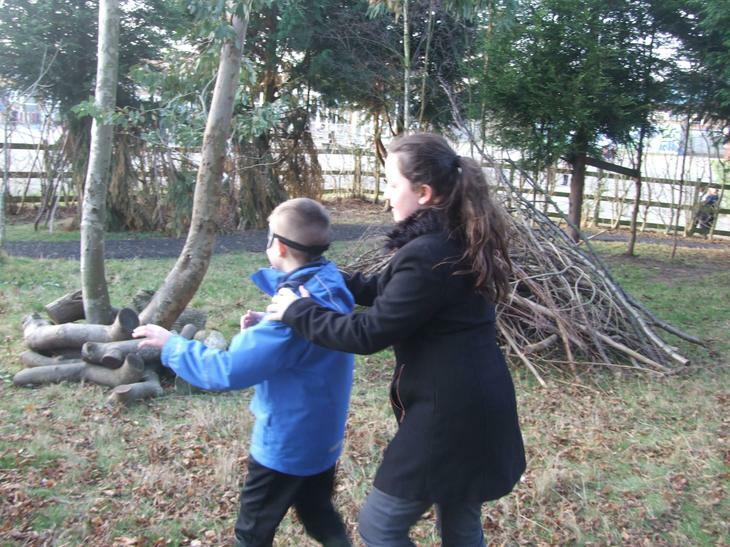 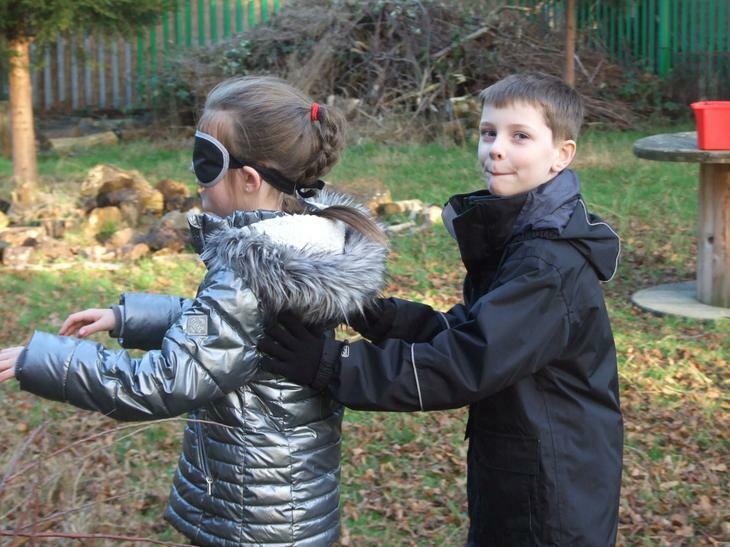 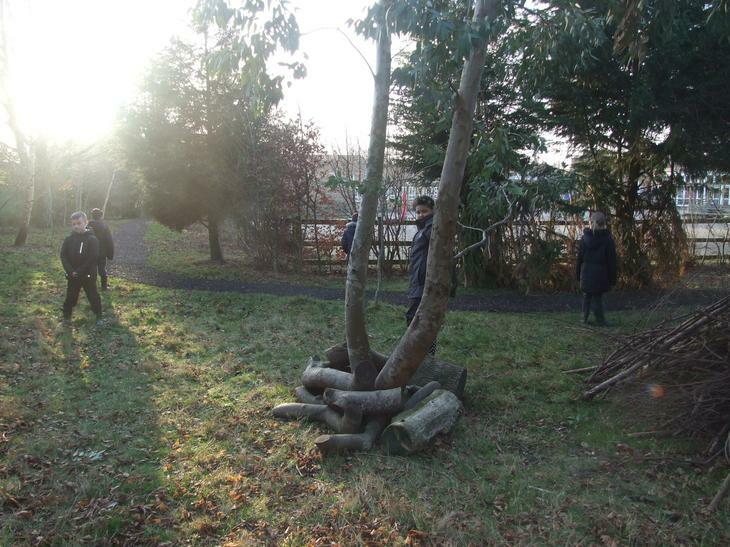 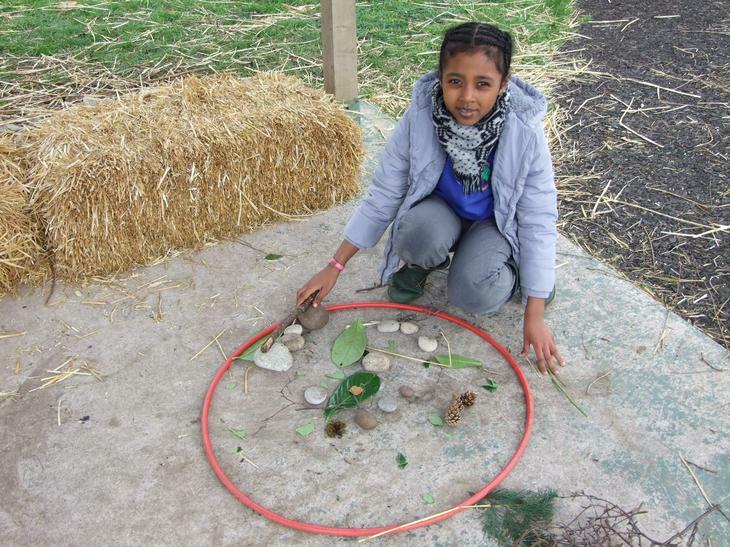 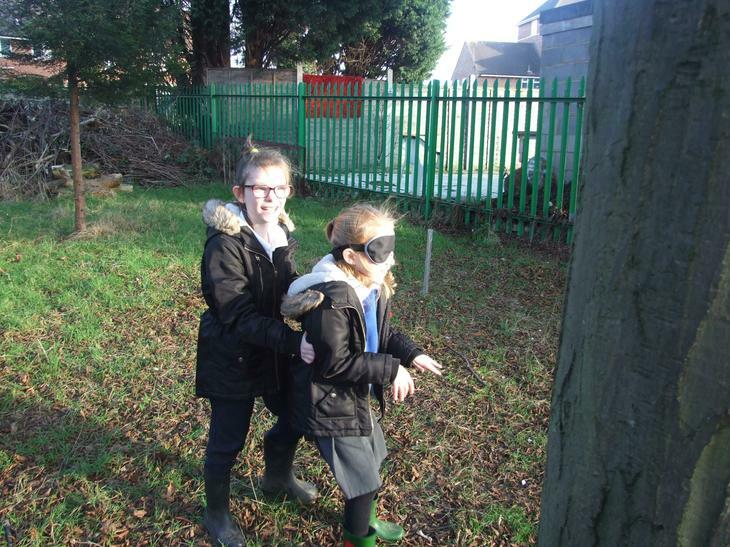 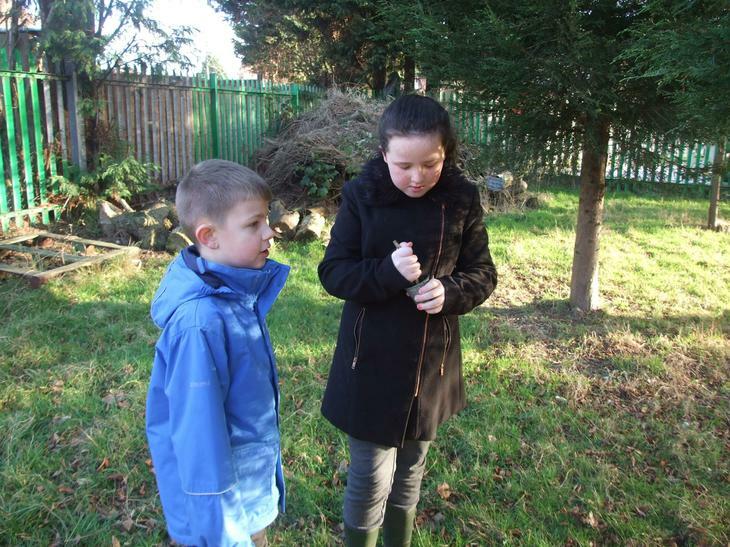 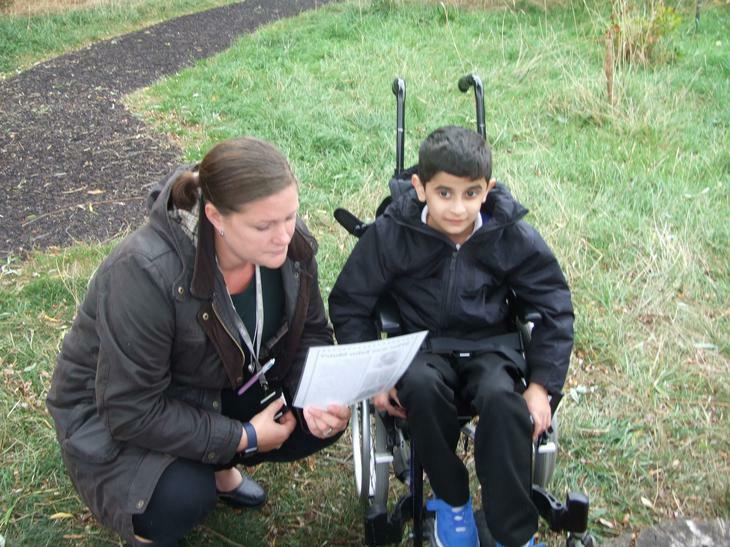 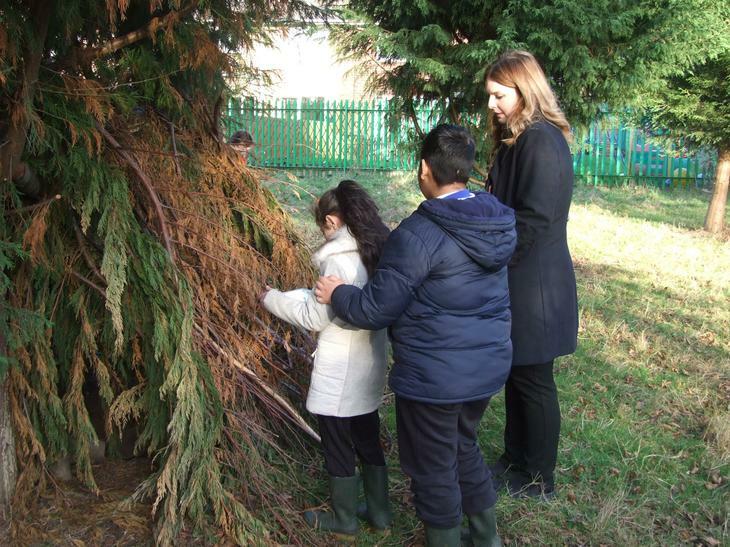 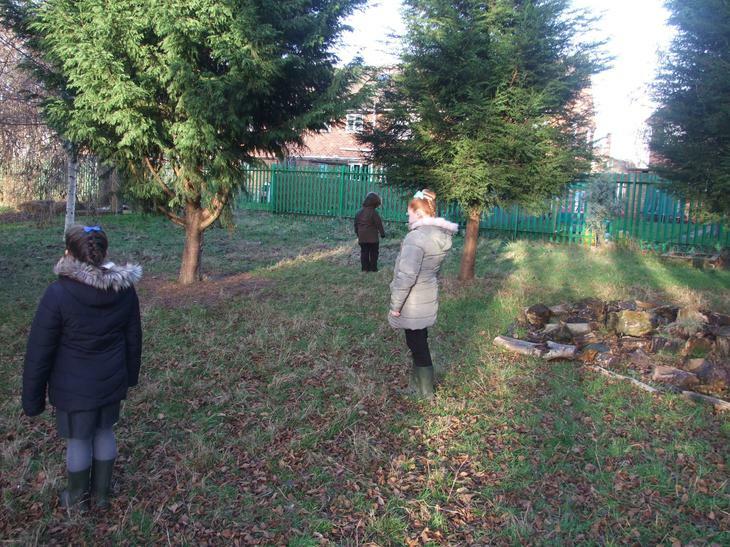 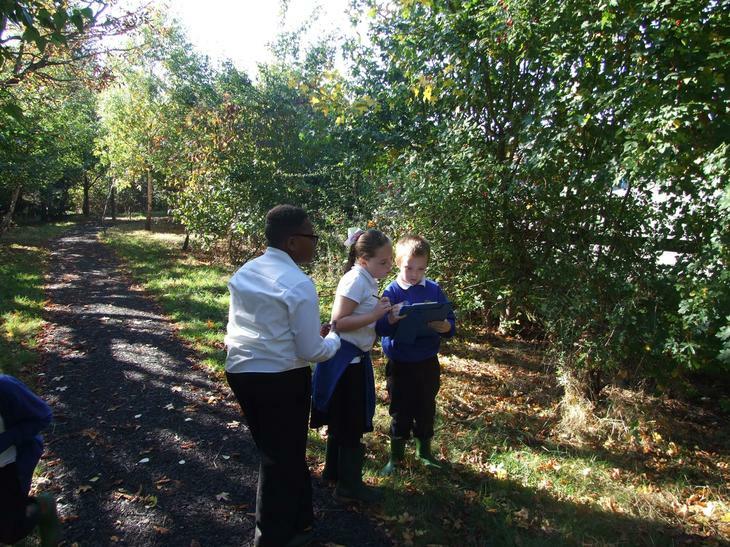 In this session the children used their senses to explore the Forest School area. 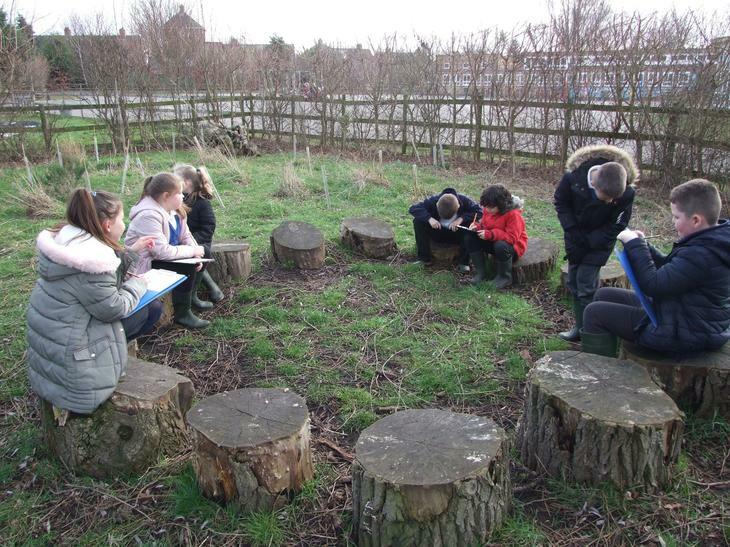 We started by standing still and listening to the sounds of the birds and the wind in the trees; the children said this was relaxing. 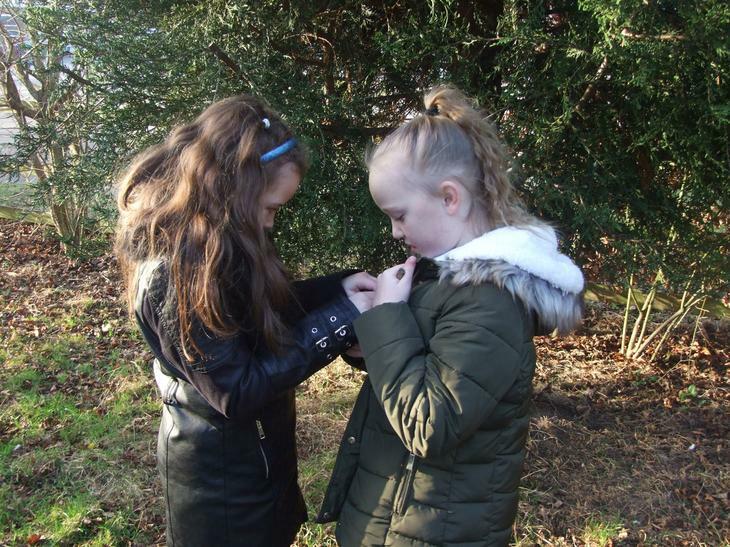 For the next three activities they worked in pairs; first on a mirror walk to see the trees and clouds above them. 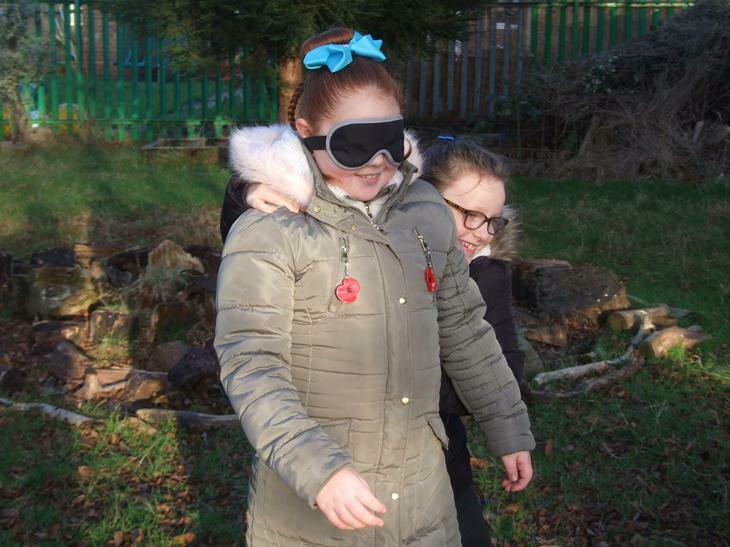 A blindfold walk followed; the children used their sense of touch to find where they had been. 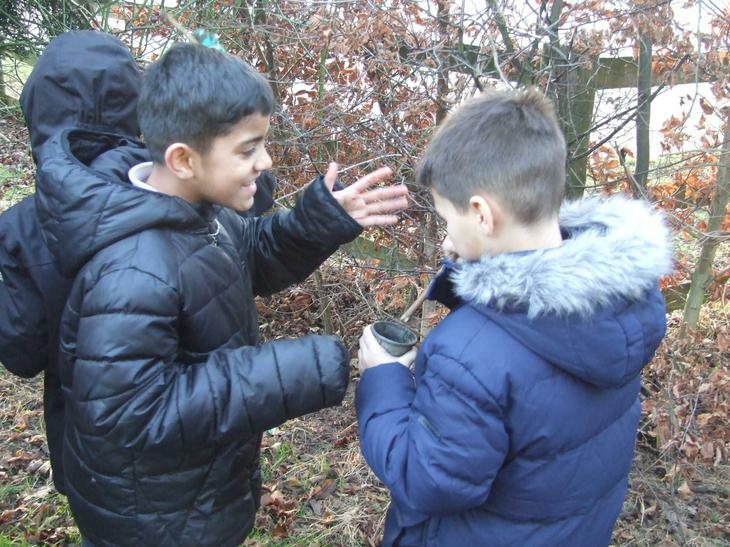 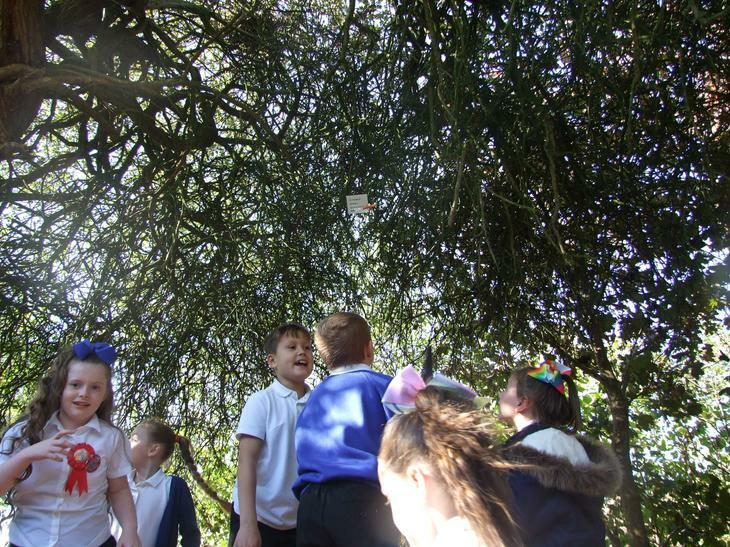 Finally the children collected herbs and leaves to make a smelly potion and they thought about what John Muir would wish for if he was alive today. 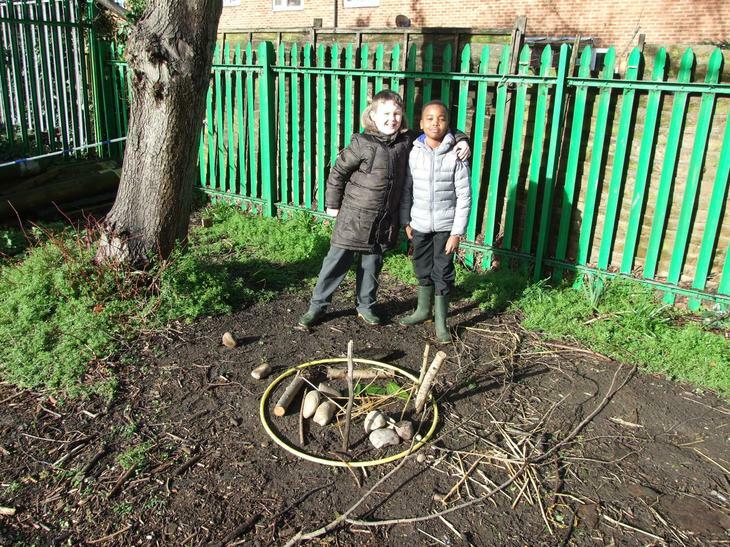 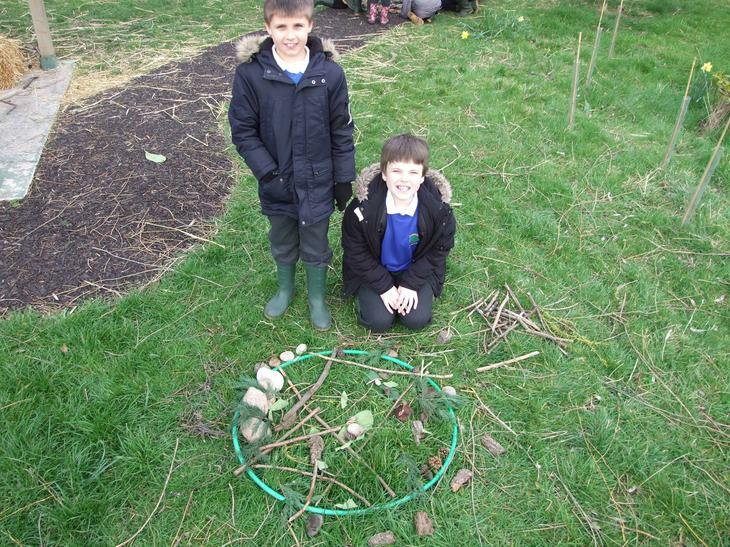 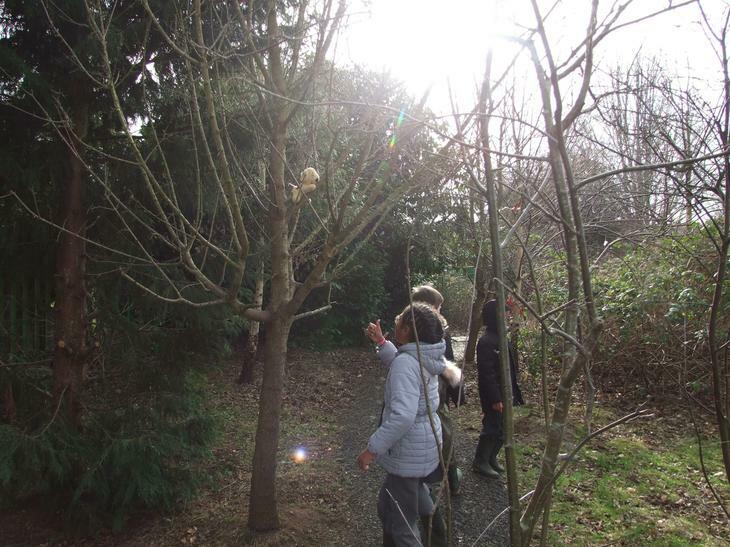 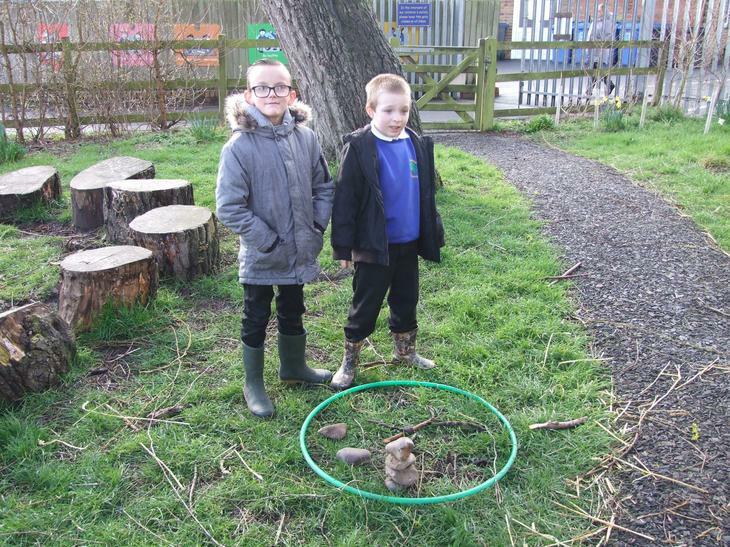 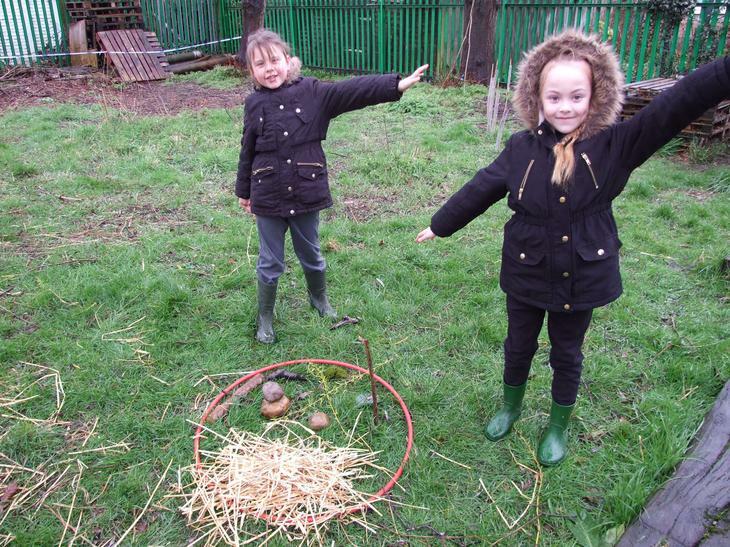 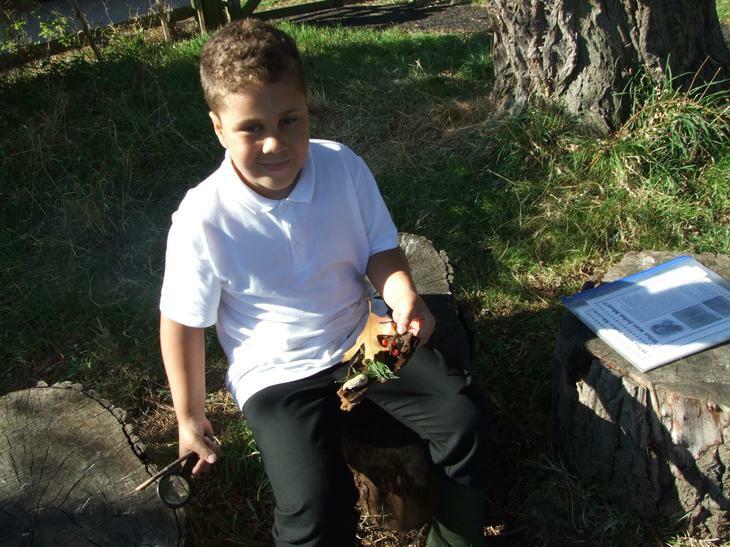 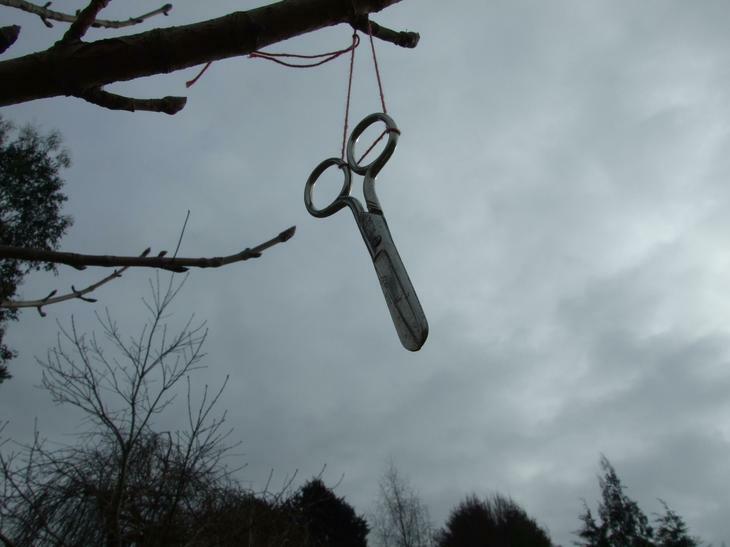 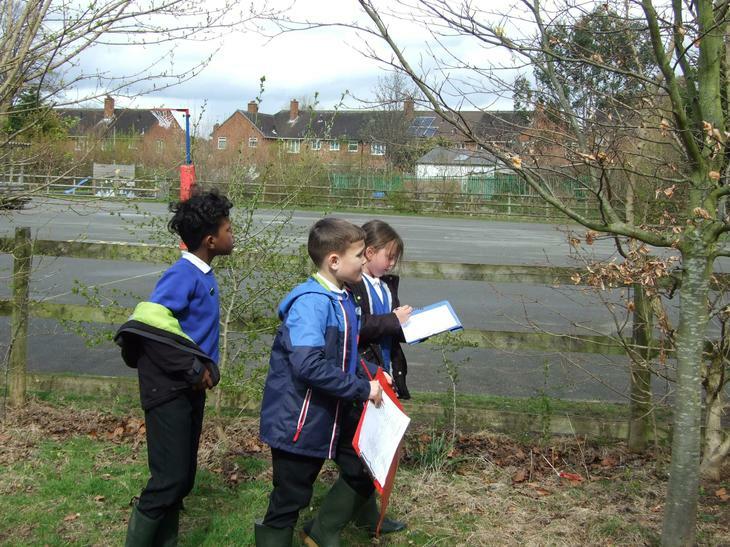 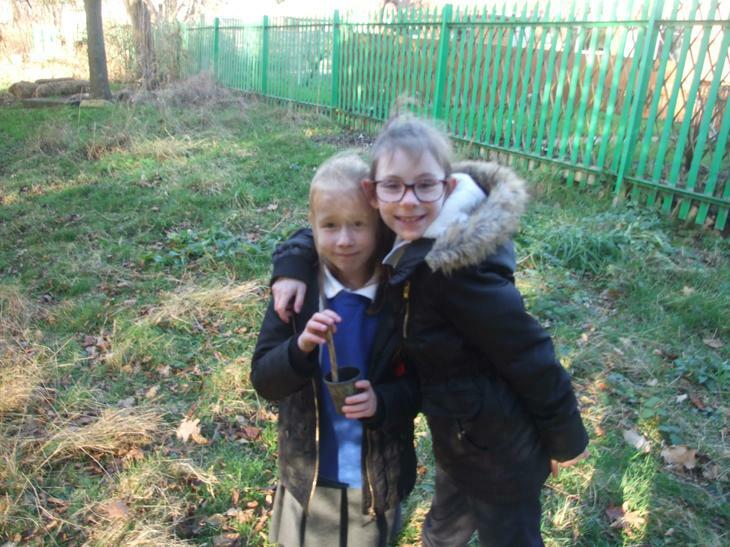 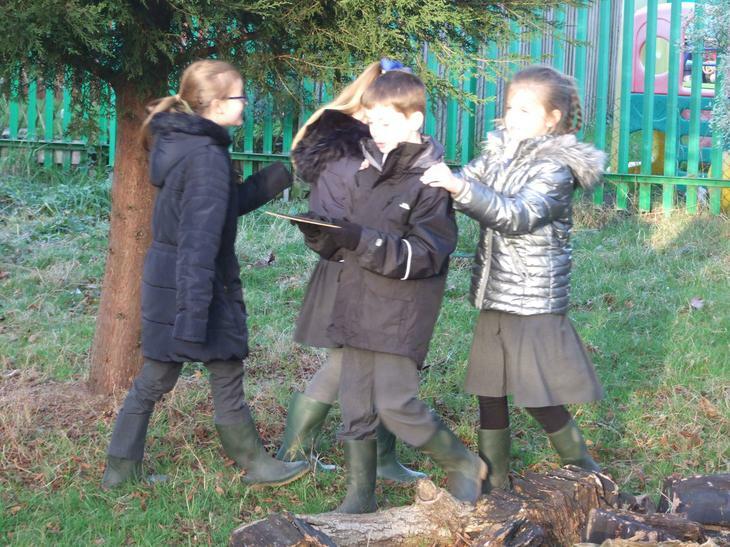 We talked about the difference between natural and man made materials then the children worked in pairs to find the man made objects around Forest School. 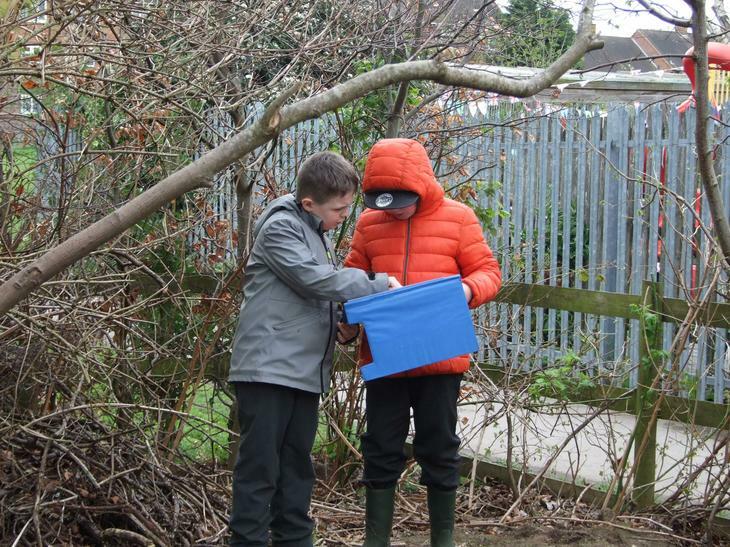 The tricky part was being able to recall as many of the items as they could when we got back to the shelter. 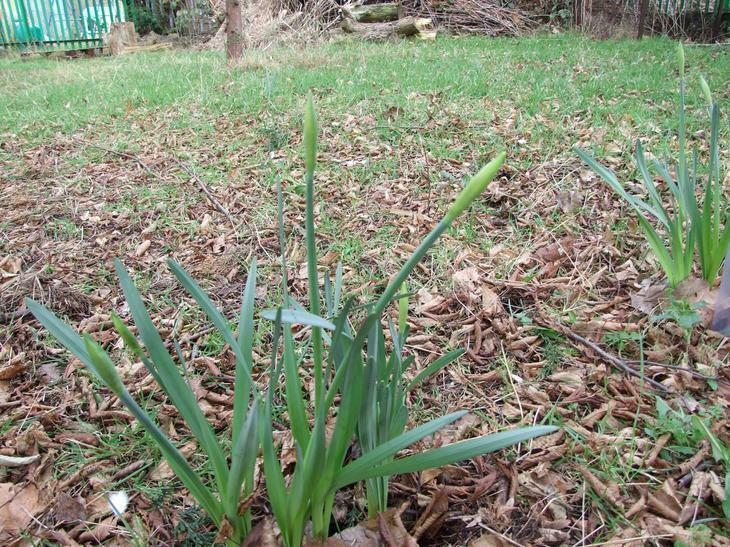 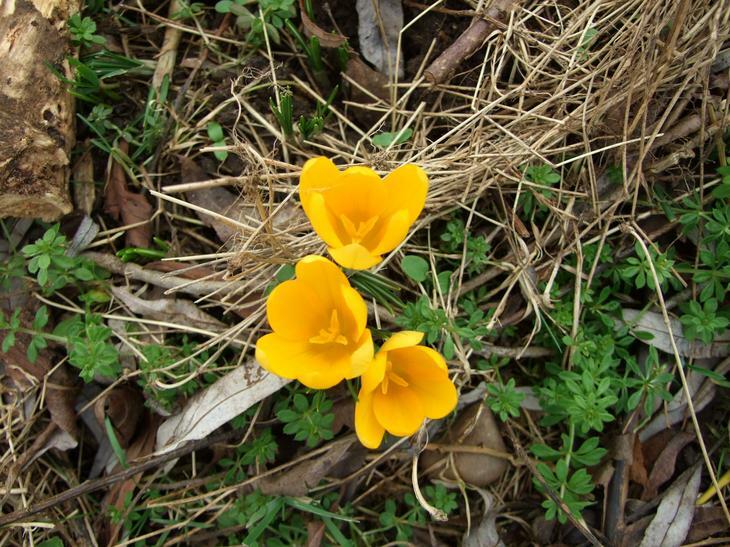 We also found that spring is beginning to come to Forest School with the first flowers starting to appear. 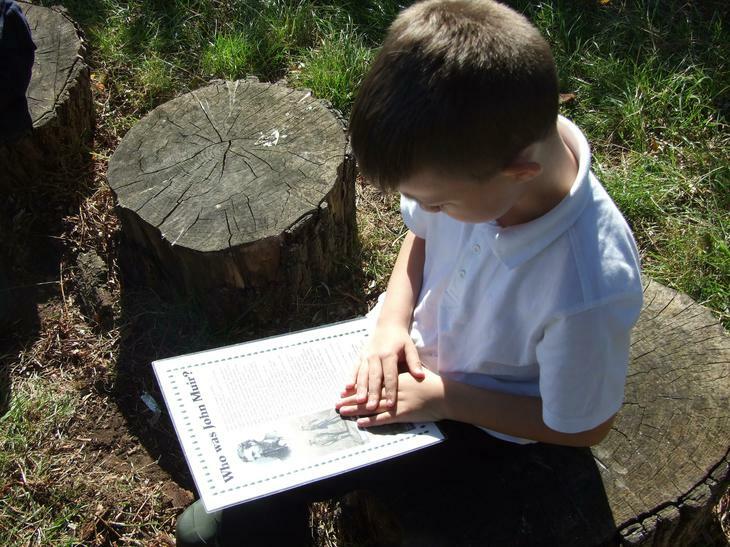 John Muir helped to create one of the first National Parks in America known as Yosemite to protect the area so that people could appreciate the beauty of the natural landscape and make it a safe haven for wildlife. 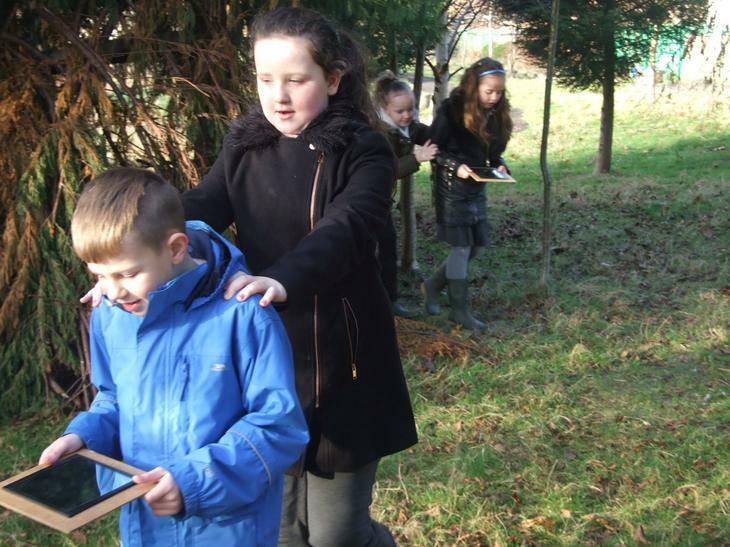 In later years this idea was copied in our country so that people can visit wild places such as Snowdonia and The Lake District National Park. 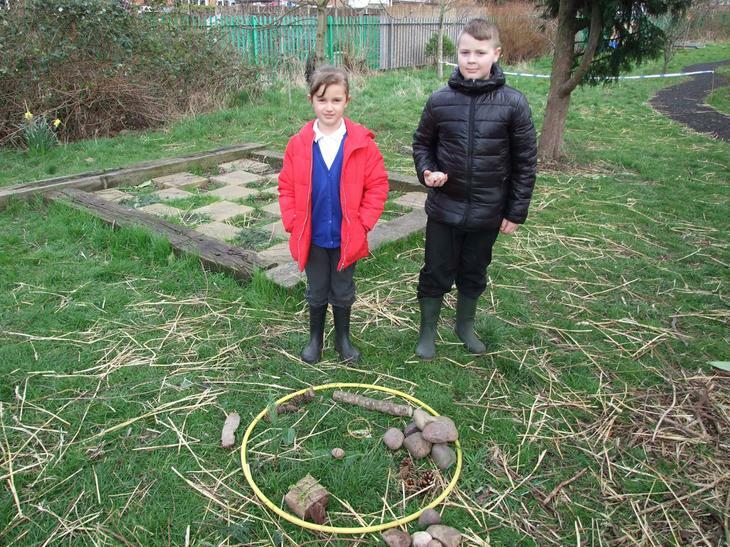 The children used this idea to create their own National Parks in miniature using rocks as mountains, leaves as lakes and pinecones as forests. 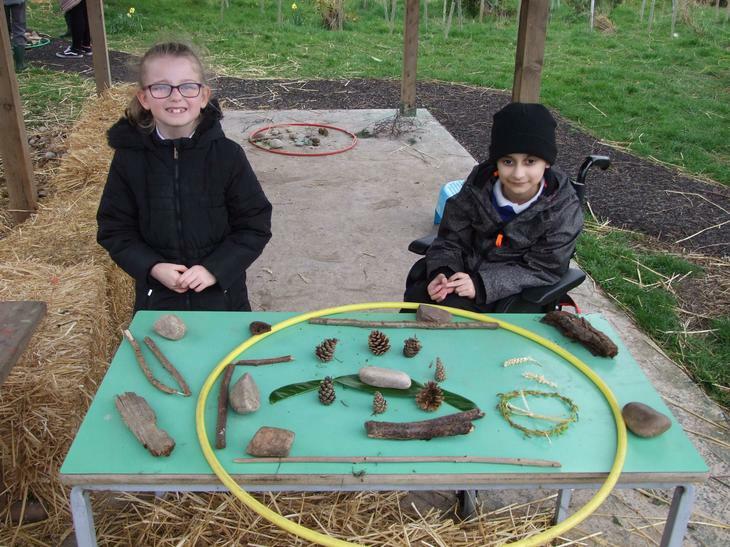 You can see their creations below. 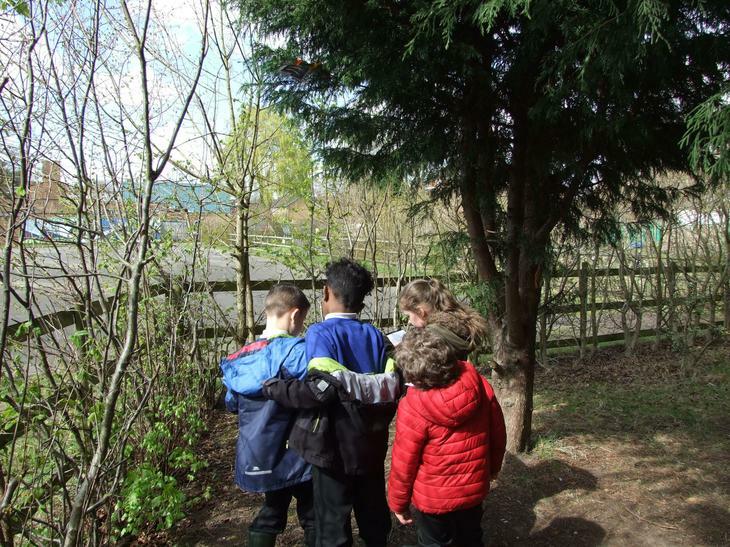 This week we have looked at how we sort living things into groups. 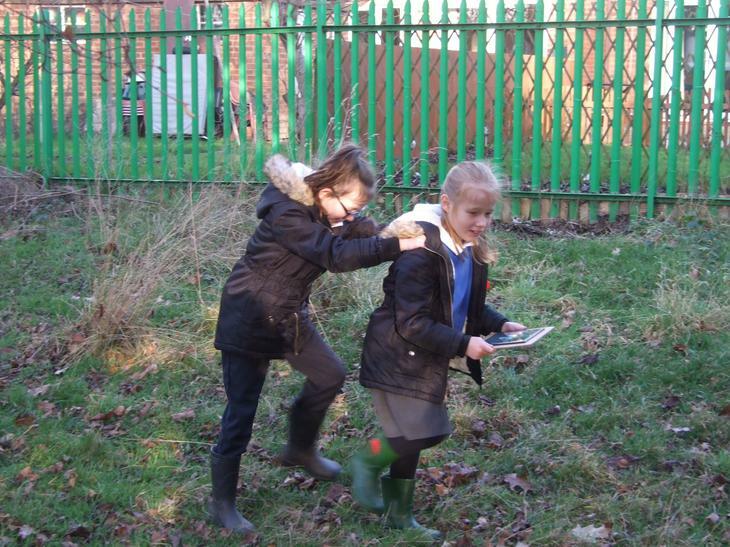 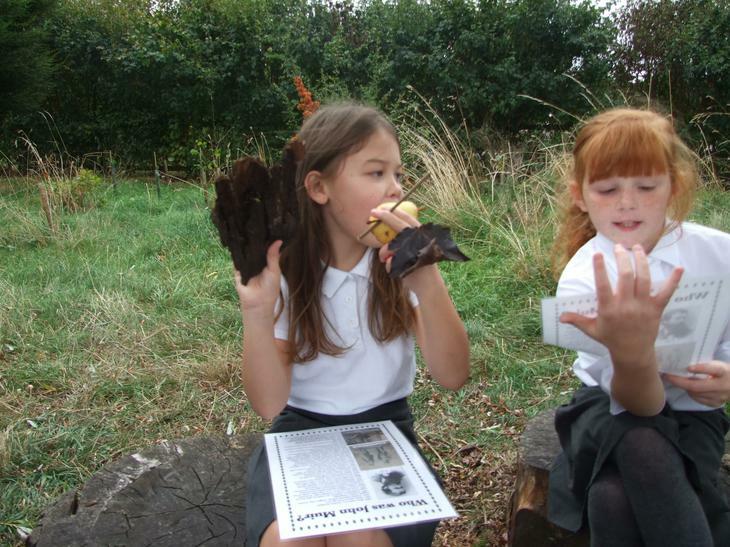 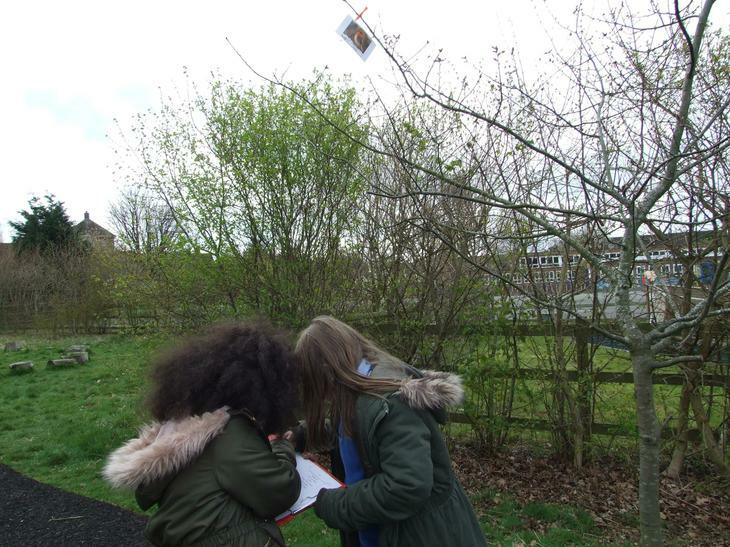 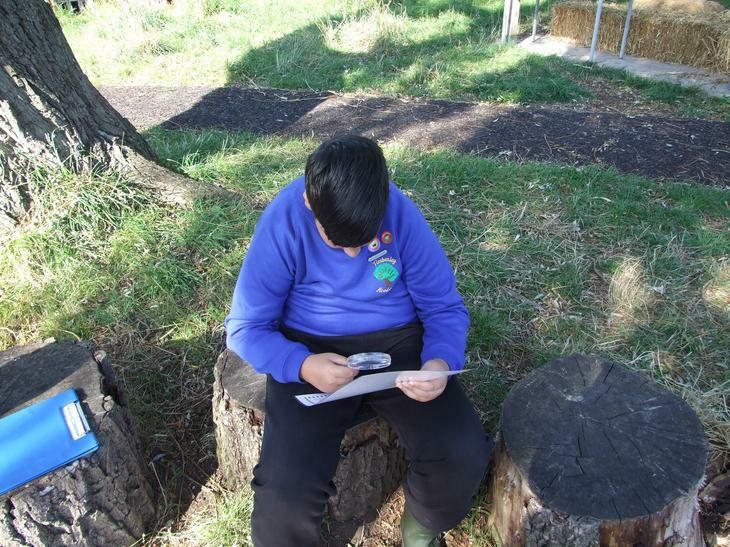 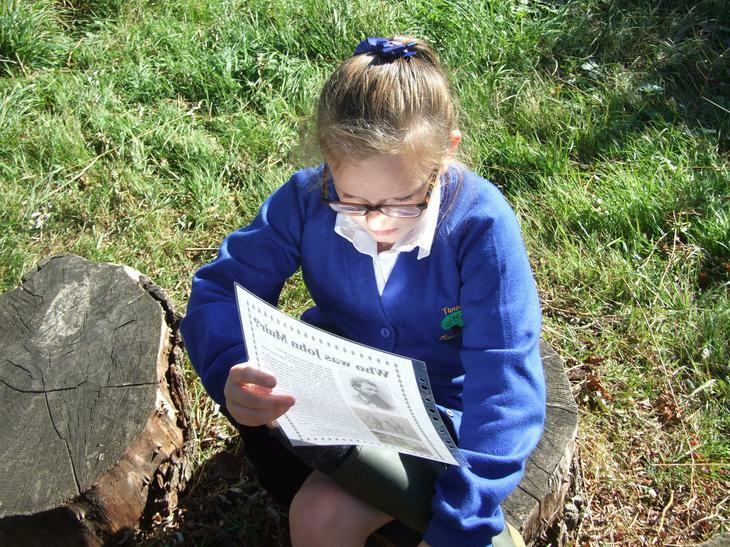 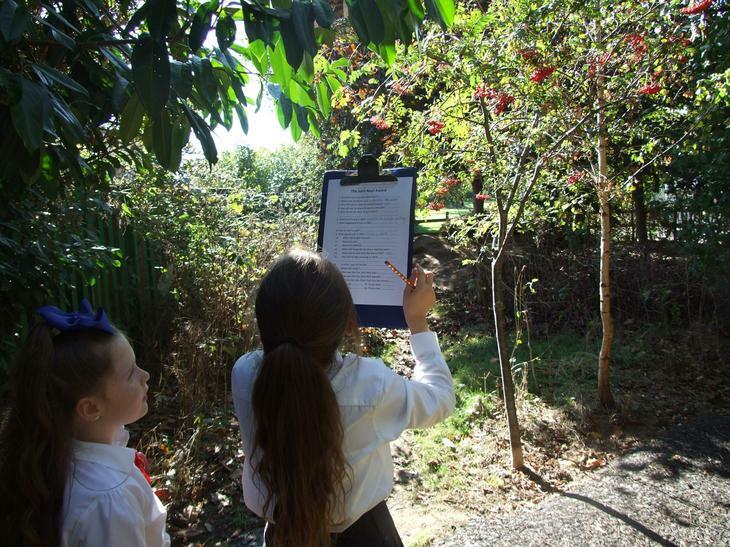 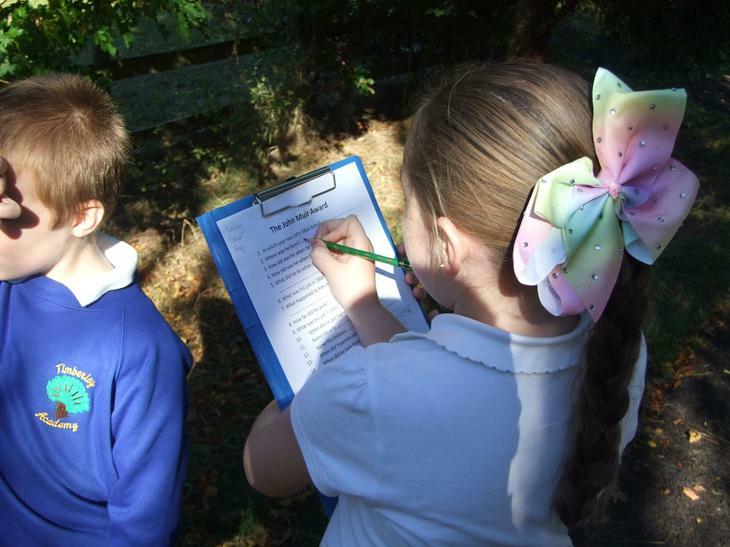 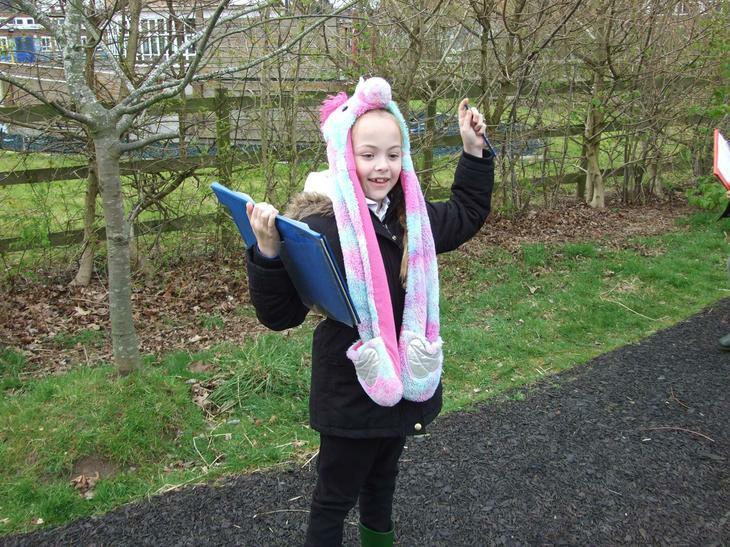 The children have to find the pictures of vertebrates hidden around the grounds and decide which group they belong to. 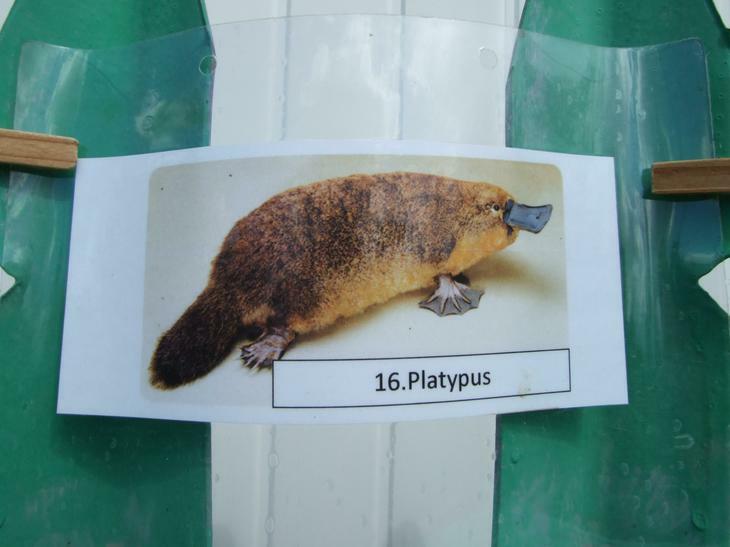 There are five groups of vertebrates (animals with backbones) these are: mammals, amphibians, reptiles, fish and birds. 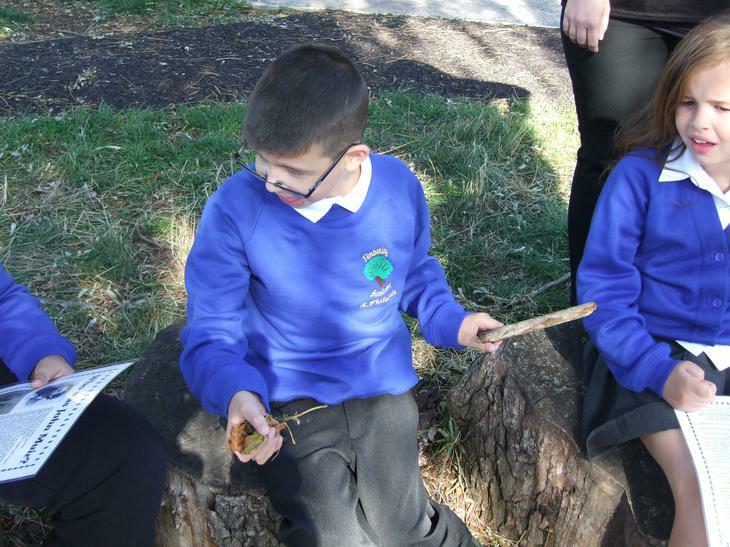 Some of the creatures they find are endangered and we talk about what this means, why they are endangered and what we could do to follow the work of John Muir to help protect them from extinction.